More Vermont Release Days: Ludlow, Hunt Middle School, and Mary Hogan, plus some great videos! 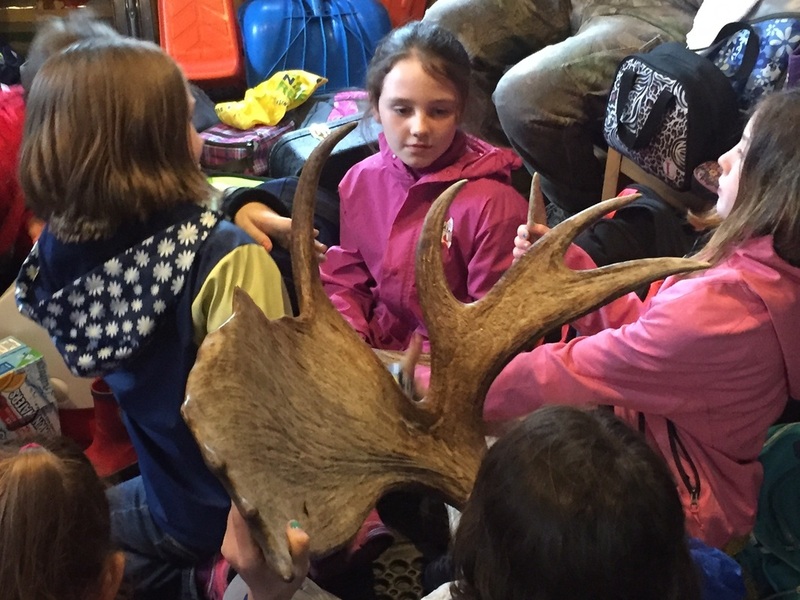 On a cold and rainy May 24th when it sometimes poured, Ludlow's third graders had a great, mostly outdoors, Release Day experience at Hawk Mountain Resort, where LES community volunteer and Trout Unlimited member Kathy Ehlers works. 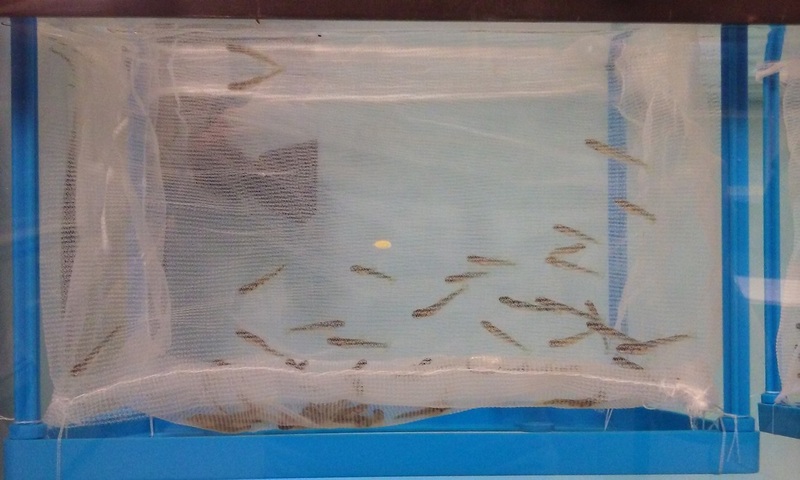 ​Here's what the 72 LES fish looked like just minutes before being netted out of their classroom home. Once everyone had arrived, Lisa Marks addressed the assembled students, teachers, volunteers, and special guests, making introductions and explaining the plan for the day. She also offered several thank-you's, especially to Okemo Community Challenge, which provided financial support for the LES TIC program and one of whose board members, Lisa Schmidt, spent the whole Release Day with the class. Teacher Lisa Marks in bright green in center; Lisa Schmidt to the left of Lisa; TU members Kathy Ehlers (principal volunteer) and Joe Kraus, back row left; Joe Mark bottom right. The first activity of the day was macroinvertebrate collecting and classifying, which I led. Students found an abundance of macros, and we could tell from many pollution-intolerant species we found that the Black River in that location is a healthy stream. Once we'd assessed the quality of the habitat where our new releasees would be living, it was time to let them go. After receiving a pint container with three to six fish in it, each student decided where to add their trout to the stream. 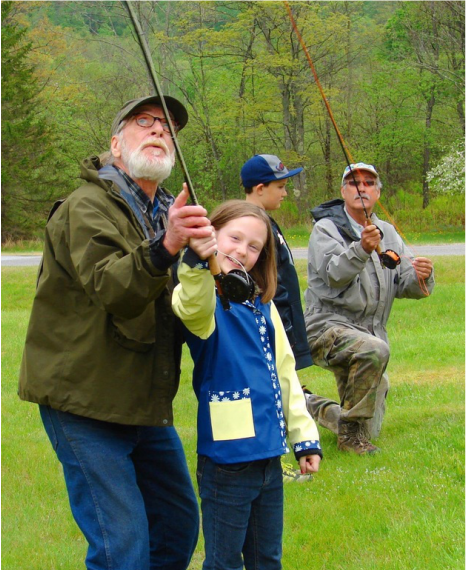 We all took a snack break; then several volunteers taught students fly casting, using equipment provided either by LES community partner Kathy Ehlers or by Hawk Mountain Resort. Those who weren't learning the beautiful art of fly fishing played games. Now on to lunch! Because of the LES release site included a trout pond, volunteer Kathy Ehlers granted the students a special treat: feeding the fish! Here's a short video of a bit of that activity. While it rained on and off most of the day, it wasn't until after the fish had had their lunch that the skies truly opened up, forcing cancellation of the planned nature walk. Fortunately, Hawk Mountain Resort also allowed us to use their recreation building. This meant shelter from the downpour and an opportunity to shift to some indoor back-up plans. Kathy had recruited Davey Davis to help with the release, and he had brought his guitar. Both a talented musician and a dedicated fly fisherman, several years ago Davey started a musical group called "Brown Trout and the Lunkers." 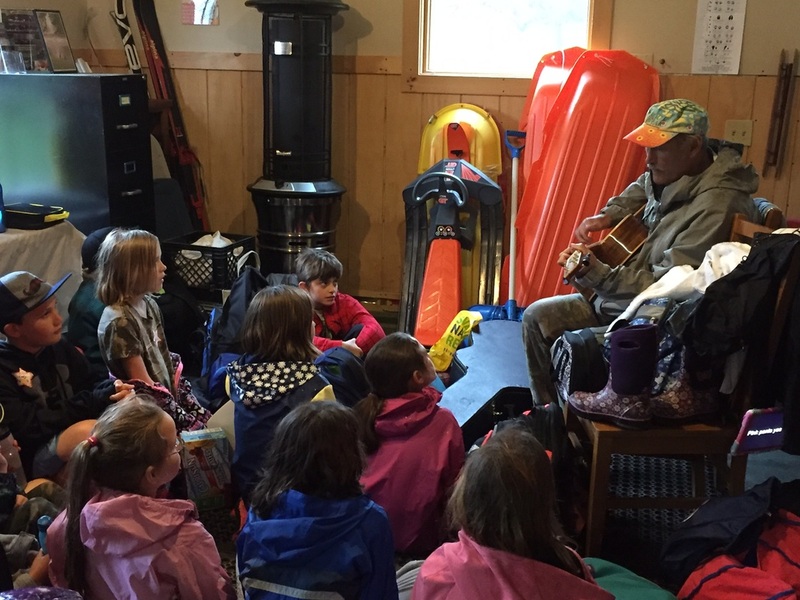 He also writes songs about trout and the outdoors he so loves and played/sang a few of those to the kids. "Brown Trout" entertains the students while it pours outside. Later, Kathy shared many interesting objects that she had brought. These included plaster of Paris casts of bear and raccoon tracks and photos of bear and moose sign on beech trees and of a porcupine den close to the release site. Finally she passed around a pair of deer antlers and--tada!--a beautiful set of moose antlers. Needless to say, there was much oohing and aahing from kids as well as adults. We might have wanted nicer weather, but we couldn't have had a better day! ​Here's a great video Scott Pease sent of their Release Day in Underhill. I'm very impressed, Scott, not only by the video but also how quickly you were able to produce it! Steve Flint held Mary Hogan's third Release Day on the upper Middlebury River near the Robert Frost trailhead. As always, Steve was incredibly organized and had recruited a veritable "cast of thousands" to help educate his students on topics that included marcoinvertebrates, stream dynamics and characteristics, the riparian zone, birdlife of the area, etc. Several individuals represented the Central Vermont Chapter of Trout Unlimited and/or New Haven River Anglers. Members of the Otter Creek Audubon Society staffed the birdlife station. 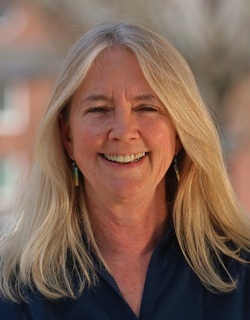 A Middlebury College visiting professor of education also led one of the stations. Since Paul Urband, of Central Vermont TU, and I hosted students at a site on the river where Irene relocated it, I was not able to take pictures of many students and volunteers. Here are just a few. Four days, three southwest Vermont TIC Release Days! My last post was about a cold but wonderful Lincoln Community School Release Day and about the fabulous book award that Ludlow Elementary School's third graders won. Since then, I've had the opportunity to participate in three more southwest Vermont Release Days (actually, by the time this gets published, it will be five additional schools, but more about that later). These schools were, in order, Middletown Springs Elementary School on Tuesday, Manchester Elementary and Middle School on Wednesday, and Poultney Elementary School on Friday. They were each different but all great. Middletown Springs released their fish on Tuesday, a day that started grey but became quite beautiful well before midday. MSES students ready to net their 77 trout. Teacher Jenn Tifft had recruited four volunteers: Hilary Solomon, Megan Muller, and Haley Macomber (all from the Poultney-Mettowee Natural Resources Conservation District), and me. At 9:00, we walked from MSES to a stretch of the upper Poultney River quite near the school. Jenn divided the class in half for our first activities. 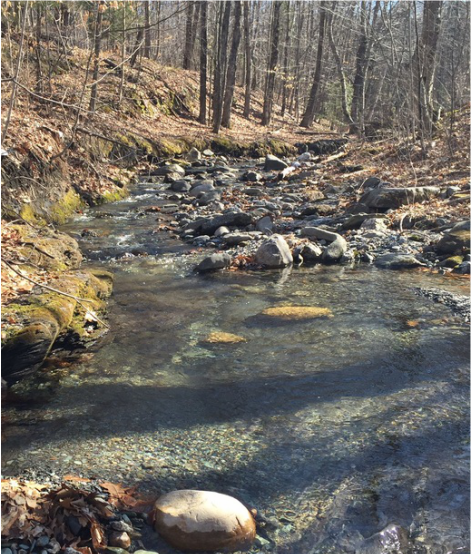 Hilary and Megan supervised students as they tested a small tributary that flows into the Poultney near our release site. Haley and I took the other group to a spot on the river to talk about the characteristics of the stream: the canopy and the riparian zone more generally, substrate embeddedness, woody debris and other in-stream structure, undercut banks, evidence of flooding and erosion, etc. Then, using a tennis ball, tape measure, and stopwatch, the students measured the speed of the river. After 45 minutes, we took a snack break at the end of which Hilary and I switched groups and repeated our exercises, only this time, Hilary had the students test the water of the main stem. While most results suggested that the chemistry of the tributary and the main stem were very similar, the phosphate level of the tributary was significantly higher than that of the main stem. Hilary led a discussion focussed on the question, "Why might that be?" Our last activity before lunch was to play the energetic but also very educational "Macro Mayhem" game, which Hilary led. (Click the Macro Mayhem link above to get instructions on how to organize the game.) Here is a brief video of the MSES Macro Mayhem episode. After a cafeteria/gym lunch of chicken and beef tacos, we returned to the stream to collect and classify macroinvertebrates. We found many of the good ones! ​Here are photos from the MSES Release Day. The last activity before the release was special. Each 6th grader organized the macros he/she had collected and met with one of the younger classes of students, K though 5th grade. They showed the students the macros they'd found and told them about them and their significance. Finally, with the whole school assembled on the stream bank, each 6th grader got approximately 11 trout, returned to the younger students they'd instructed about macros, and released their fish. A great day! Wednesday, Manchester Elementary and Middle School's Release Day, was perfect from the start and took place at an altogether beautiful piece of property on the upper Mettawee River. I arrived at the school at 11:00 to help the students net and count their fish. Becki Trudell, program director at the American Museum of Fly Fishing, came to join the fun. 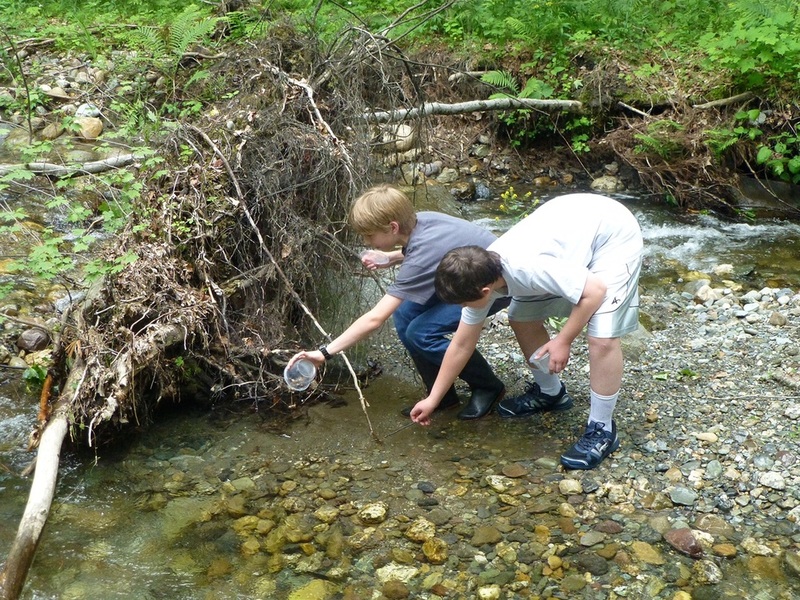 Once the school bus delivered students and faculty to the stream, students, supervised by the many volunteers who had also come along, broke into small groups to collect and classify macroinvertebrates. Again, a successful activity! Along with the bugs, students also found small trout as well as eggs, both viable and dead. We assume the seemingly viable eggs must have been those of a rainbow trout. After the macros activity, each group of students received a container of six or seven trout, which they took to the special spot they'd chosen to release their fish. When, up and down the river, the various assemblies of budding ichthyologists let out a whoop, we knew that another half dozen brookies were now in their new homes. We ended circled up on the lawn for thank-you's and final reflections. I took that opportunity to ask the students whether they had enjoyed these activities. All had. Then I asked whether someday they'd like to do this kind of work for a living and get paid for it. A great many said they'd love to do that. I urged them to study hard, go to college, and pursue that passion. At 8:30, Keith Harrington, Poultney Elementary School fourth grade teacher, and his students began walking to the release site while two of Keith's students and their mothers netted and counted the PES fish. There were 75 of them--a nice number--which they put in an aerated cooler. Then we transported the trout to the Poultney River at a point where it wraps around the west side of the Green Mountain College campus. After scoping out the river with Beth Miller, education and outreach specialist with Poultney-Mettowee Natural Resources Conservation District (P-MNRCD), we picked the area where the students would release their trout, and Beth helped me carry the cooler to that spot. We placed it in the shade. Keith assigned his students to four groups of five or six students each that then rotated through stations spread up and down the river to participate in 45 minute learning activities. At one station, Green Mountain College biology Professor Natalie Coe taught students how to test river water, including for chemical compounds they didn't test for in their classroom. 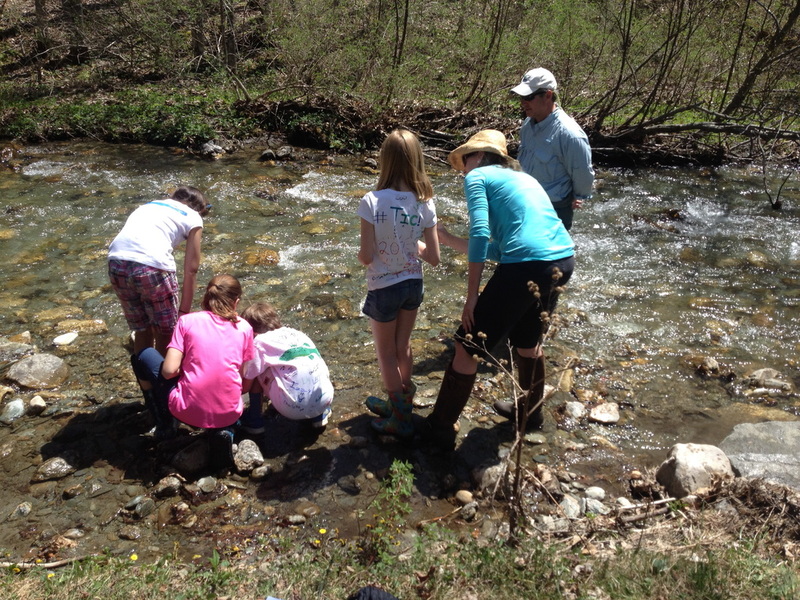 Beth Miller introduced students to the physical characteristics of the stream and its surrounding riparian habitat. Megan Muller, recent GMC graduate and intern with P-MNRCD, used a "stream table" to demonstrate to students how rainwater moves through a watershed and how pollution--cocoa powder in Megan's simulation--would be distributed if it were introduced into the system. Haley Macomber, UVM senior and summer intern with P-MNRCD, helped me explain the procceses of collecting and classifying macroinvertebrates. ​PES's release occurred in the middle of the day, following remarks by Keith Harrington, who also thanked the Poultney Rotary club and a generous anonymous member, who funded the start-up of the PES TIC program. Keith also presented the beautiful TIC quilt that a PES parent and grandparent assembled out of squares made by PES students and, especially, students at 25 other schools across the country. Finally, each student read a trout reflection essay that he/she had written. All together, it made for a great send-off for their 75 trout. Here's a video of one of the PES students reading his trout reflection essay. ​Pulling into the LCS parking lot, I was impressed by the number of cars saddled with three or more inches of heavy, wet snow, but as I snaked the last few miles up Lincoln Road, the "hoar frost" on the over-hanging mountains signaled the weather we should expect for Lincoln Community School's Release Day. Indeed, when I checked my fishing thermometer, the air temperature was 40 degrees, identical to the temperature of the beautiful New Haven River, curving around the back side of the school. Just two days earlier, the river had been 50; so our young fry, who'd been living in a comparatively comfortable 50-degree classroom tank, were in for a thermal shock. Intermittent snow flurries punctuated a day that was glorious in spite of the weather. Here's some of what the day looked like. LCS had terrific community support for its Release Day. Several members of the Central Vermont Chapter of Trout Unlimited contributed, including chapter TIC liaison Bob Wible and his wife Nancy and Nancy Crandall and Doug Zehner, who taught fly casting both outdoors and in the school gym. 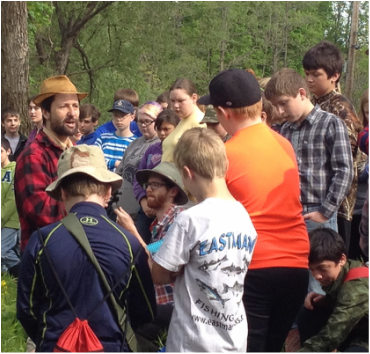 Joe Nelson introduced students to riparian forestry; and Craig Zondag, of the Otter Creek Audubon Society, led students through the riverine woods in pursuit of songbirds. 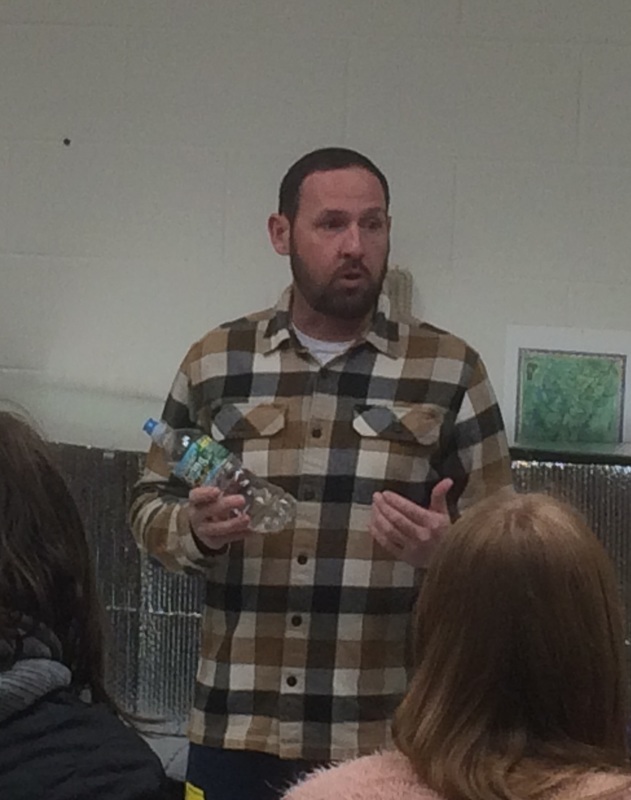 Steve Atocha, owner of Middlebury Mountaineer, taught the 5th and 6th graders beginning fly tying; and Ashley Eaton and Sam Clerkin from the Lake Champlain Sea Grant program--Watershed Alliance, paying a second visit to LCS, guided a macroinvertebrate collecting and classifying activity. Also assisting were members of the New Haven River Anglers club. Four groups of students, eight to nine in each group, rotated among the four activity stations that had been set up. When each of the groups finished their macroinvertebrate collecting activity, we took the students back to the classroom and asked, "How long is it going to take the trout to adjust to finding natural food in the stream?" As with the MEMS students (see previous blog post), the guesses were all over the place, but most students didn't think the adjustment would be--INSTANTANEOUS! As it was. ​I can't think of a better way to teach the concept of instinct. Finally, shortly before 2:30, Bob Wible, teacher Mikaela Frank, and I transported two coolers--holding, how many? 143 very healthy-looking brook trout!--down to the banks of the river and got organized for the release. Within minutes, all the other students and teachers at LCS joined us to celebrate an unusually successful Trout in the Classroom season. After brief remarks, the fish were released into their new--now we know--macro-filled home, and everybody cheered. PS: To date, with the exception of two schools that kept their tanks very cold (38 or 40 degrees), the LCS total is a state record. Of course, at least two dozen schools are still growing their trout, so that could be eclipsed. When we'd finally netted the LCS trout out of their tank and were able to count them, Mikaela, who thought they might have had "80 to 100," had this to say. ​Earlier today, Ludlow Elementary School's Lisa Marks and her 3rd grade students got some very good news. Lisa had entered the wonderful book of TIC-related water color paintings and text that her students had created into Scholastic Magazine's national "Kids Are Authors" competition. This is the 30th year of this prestigious award, which annually receives 1,500 to 2,000 entries. Scholastic awards a first place winner and 25 honorable mentions. Never before has a Vermont school made the list, but in the final year of the competition, LES was chosen as one of the honorable mentions. I addition to this very special honor, Ludlow Elementary will be able to purchase $500 worth of books of their choice. For those of you who haven't seen or don't remember the Ludlow Elementary School's student's beautiful artwork and text, you can find it on the slide show page here. A new type of fish food! On Friday, May 13, I taught two classes of Manchester Elementary and Middle School 6th graders about macroinvertebrates. Teachers Seth Bonnett and Melissa Rice turned their students over to me for two wet and wonderful hours, one hour per class. Earlier I'd gone to the Mettawee River, where next Wednesday MEMS students will release their trout, to collect macros. I brought two coolers that I'd adapted with battery-powered aerators and digital thermometers. I also brought a home-made "kick net" (two 3-foot-long sticks with netting/screening stapled to them) and several frozen bottles of water to keep the temperature cooly stable. A rudely timed downpour drenched me as I was right in the middle of my collecting activities. I used a PowerPoint presentation to explain macros and, especially, introduce students to the three principal species of living trout food that we hoped to find in the Mettawee: mayflies, caddis flies, and stone flies. One of the PPT slides took us to a four-minute YouTube video (below) that explained how, by collecting macros, one can calculate the Biotic Index of a stream, a measure of its health. Teacher Bonnett assigned students to one of five groups, each of which got a kit of supplies, including collecting tools, containers, and macro identification charts. Then I put approximately two quarts of debris- and macro-filled stream water into every group's wash basin and told them to find, classify, and count the macroinvertebrates. Finally, the students used their insect data to calculate the Biotic Index. (Well, actually, not all of the groups got to that point in the time we had available, but some did.) It seemed that the students, even the initially squeamish ones, really enjoyed the activity. As we were wrapping up, I asked the students how long they thought it would take for the fish to learn to feed on the natural insects in their new environment as opposed to the artificial food they'd been eating for the last few months. Guesses ranged from a month or more to "instantly." So I suggested that we should see what would happen if we put the macros they had in their collecting dishes into the room's trout tank. When the first group poured their bugs into the water, their shrieks and cheers gave away the answer. "Instantly" is right! I can't think of a more powerful lesson in instinct. Here's a short video of that moment when a MEMS girl pours her groups macros into the tank. You can find the "Know Your Macros" PowerPoint slide show, insect identification charts, and the Biotic Index PDF in the "Resources for TIC teachers" folder on the Google Docs site. Time to release the fish! Vermont schools have begun to hold their Release Days. The first in my area of southwest Vermont occurred last Friday when 24 Dorset School 5th graders released, conveniently, 24 beautiful brookies. Here's a slide show of photos from that day. Here's a partial schedule of 2016 Release Days. Keep those reports and photos coming! Mollie Sprague and Mikaela Frank at Lincoln Community School--with the help of TIC liaison Bob Wible and Doug Zehner and Paul Urband, two members of the Central Vermont Chapter of Trout Unlimited--provided a wonderful dissection demonstration and hands-on learning experience for LCS 5th and 6th graders. Here is the great slide show Mollie put together. 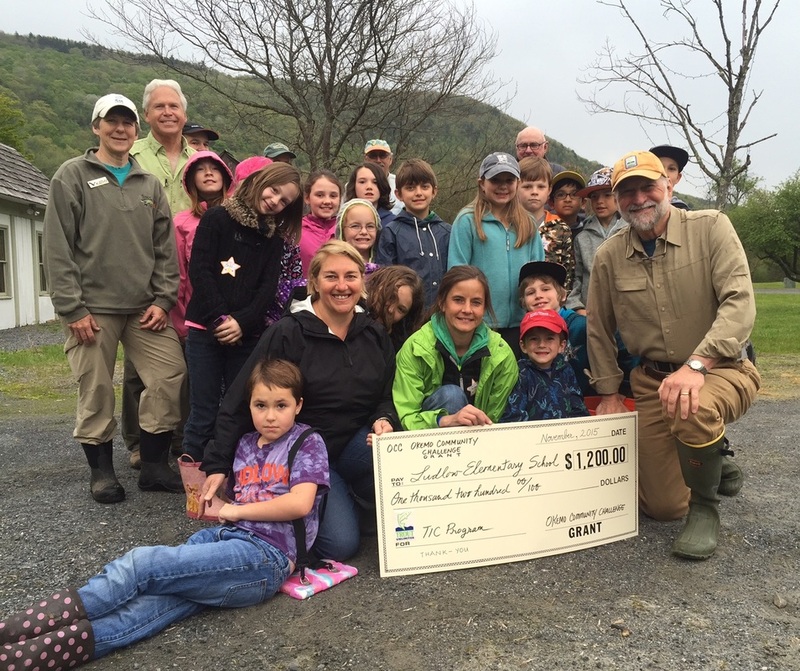 The national office of Trout Unlimited works hard to recruit youth who will be the next generation of stewards of our environment, especially its cold water rivers and streams. Toward that end, it has created the Stream Explorers program, designed to appeal to elementary and middle school students. 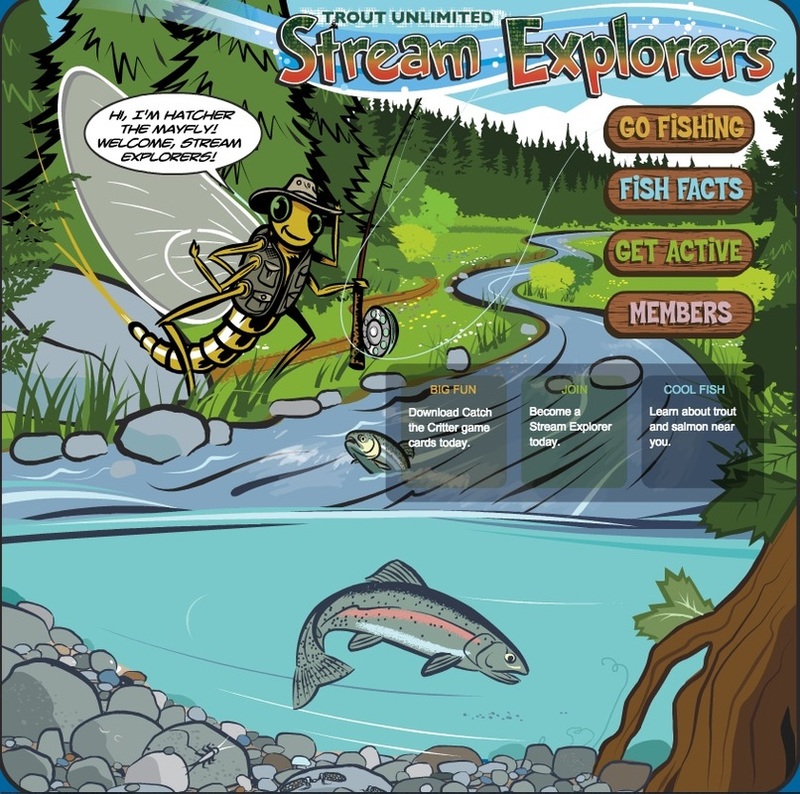 The Stream Explorers program also provides informational and educational materials for parents and teachers to use with their children. These attractive, colorful four-page documents include interesting stories on topics such as trout food, trout life cycle, watersheds, human impacts on trout habitat, etc. Click the following link to go to the folder containing eight Stream Explorer publications. Almost time for Release Day! What's the water temperature? Joe's TIC "dance card" is filling up fast with Release Days. My first of the season will be this Friday, when the students of Karli Love's 5th grade class at the Dorset School will release their fry into the upper Mettawee River in Dorset Hollow. They'll also be collecting and classifying macroinvertebrates and learning how to "read" a stream and its diverse sections/areas. I'll have most of next week off, but after that, I'm signed up to help with six Release Days in 10 days, on May 16, 17, 18, 20, 24, and 25. It'll be a busy week and a half! 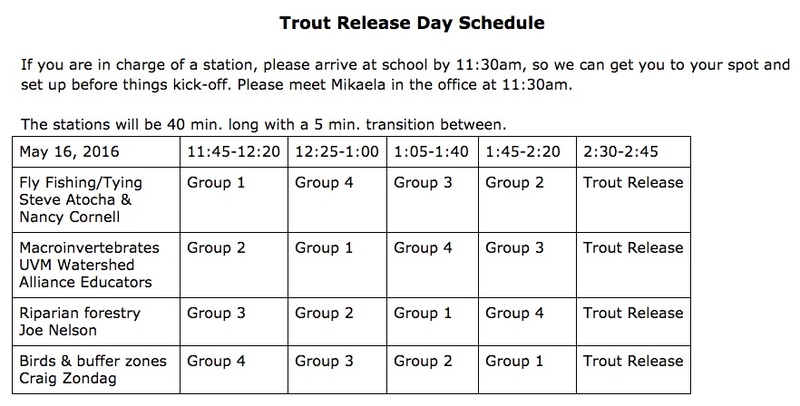 As an example, here's the schedule I got from Mikaela Frank for Lincoln Community School's Release Day on May 16. And what's the water temperature of local streams? ​I just got back from the Castleton River near my home on a grey and rainy Wednesday afternoon when the air temperature was 48 degrees. So what was the river's temperature? 46 degrees! That's not an indication of what the temperature of your release stream is at present, so you should get out there and measure it. But almost certainly, waters will start to warm rapidly over the next two weeks, as the daytime temperature will be well into the 60s for most of that time. 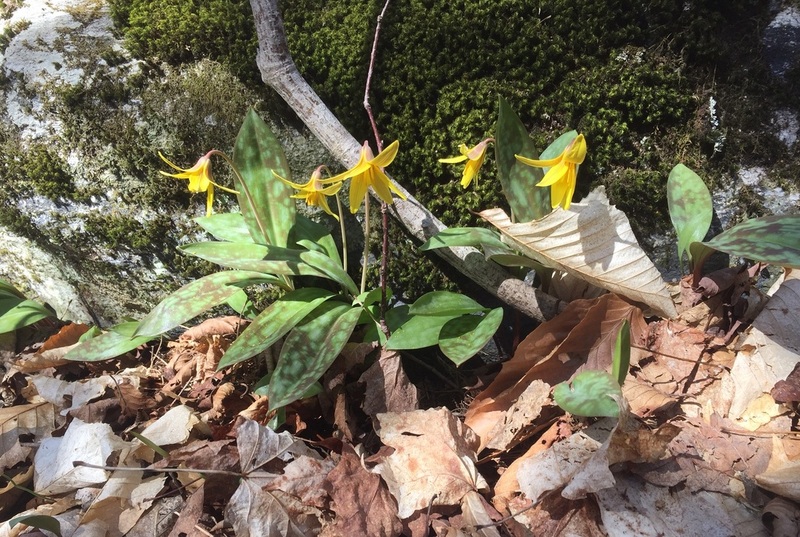 Finally, on a hike with my Hornbeck canoe into Little Rock Pond in the Green Mountain National Forest on Monday, I encountered many beautiful wild flowers. Here are two photos I took. Here is a picture taken by Chelsea 6th grader Maddy Rooney. In each photo you can see the lump on the underside of the trout. The coloration of the lump was very similar to that of the eggs as they were in later stages of development. This lead the students to hypothesize that the lump was an undeveloped twin. We are not sure how long the fish was dead in the tank. Possibly 3 or 4 days. We discovered it while using the siphon to clean the gravel. The little particles surrounding the fish were stuck to the fish when we retrieved it from the siphon. My guess is that these are either yeast or bacteria colonies. Further update on Chelsea trout: They all survived April vacation and are significantly larger than when we left. Today we gave them their first taste of macro-invertebrates and they responded vigorously. Below is one of the pictures Maddy took. Thanks for the great photo, Maddy​! In response, I sent Erik's report and photo to Green Mountain College Professor Meriel Brooks, who kindly replied with the following. It's really hard to tell what that might be. I think of things like tumors and parasites when I see lumps on fish. Usually fungi are lighter in color, and the color itself looks like the little fish's melanophores (pigment cells). You might be able to determine with a microscope (dissecting scope). It's likely to be a tumor of some sort. The tan stuff is also hard to determine--resolution is not good enough--both bacteria and yeast would be likely suspects. I assume those grew after the fish died. ​Guy Merolle's students at the Castleton Village School gave a wonderful series of presentations based on their research into diverse characteristics of the Castleton River, which flows east-to-west just north of their school campus. What is a watershed? What is our watershed? What factors affect the health of a watershed? Castleton University Professor Andy Vermilyea attended the students' presentations and, subsequently, shared some of the research that he and his students have been doing on the Castleton River. Here are a few slides from the CVS student presentations. Yesterday we were down at Hildene Farms, taking part in a one-room-school-house program and on a whim decided to call Orvis to see if we could stop in. They were more than happy to have us stop by. They gave us a bucket of food to feed the trout, talked with us about the fish, let the kids look at flies, and offered their restrooms which meant having kids walk around the store a bit. They were extremely welcoming, and the kids had such a good time. The best part is that we didn't lose anyone in the trout pond! The fish in our tank are doing great! Here are some pictures Lisa sent me. It's not uncommon for a TIC school to lose all or almost all its fish. Last year, Guy Merolle, of the Castleton Village School, returned from the 8th grade trip to Washington to discover that the chiller had been turned off. The water temperature was 75 degrees. When he had left for D.C., Guy and his students had more than 75 fish; now all but four were dead. When Jenn Tifft's students at Middletown Springs Elementary School learned of this tragedy, they voted to donate some of their trout to CVS. Here's a picture of Jenn and her MSES students as they were about to put their fish in my car. Below that picture is one of CVS students happy to be getting a few more trout from MSES. Well, this year it happened again. 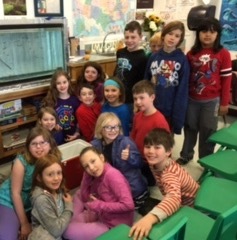 When Jessica West's 3rd graders at Shelburne Community School learned that the students of Eden Central School lost all their fish, the SCS students, too, decided to make a donation. Bob Wible, TIC liaison for the Central Vermont Chapter of Trout Unlimited, visited Shelburne on April 6 to accept 30 beautiful fry raised by SCS students. Shelburne students asked Bob many questions about the water conditions of the receiving school, for example, was the temp 52 and was the water clear and clean. Above, Shelburne Community School trout philanthropists. ​Then Bob drove 62 miles to the Eden Central School to deliver a very special present to Kara Rublee's and Betzi Goodman's 5th and 6th graders. Bob told the Eden students about the Shelburne students' concerns. Immediately the students started doing water tests. They were also surprised at how large the parr were and wanted to know how much large they might get. ​Here's a photo of Bob with the Eden students just before resupplying their tank. Look at those lovely fish! Transferring trout between classroom tanks can't be done without authorization. Before arranging to add some of the SCS trout to the Eden tank, Bob asked for and was granted permission to do so by Tom Jones of the Vermont Department of Fish and Wildlife. Finally, it looks like some of the tanks that have had persistently high ammonia for a long time are starting to cycle. After two weeks of ammonia readings of 4 ppm at Ludlow Elementary School, late last week ammonia finally dropped to 2 ppm. Just as important, nitrite has slowly started to rise. This may have something to do with the fact that last Sunday, teacher Lisa Marks and her community partner, Kathy Ehlers, added two more bags of Chemi-Pure to their filter. LES was one of several schools using the Fluval 406 filter that received two rather than the recommended four containers of Chemi-Pure. ​As I wrote Lisa in an e-mail, "Hallelujah! And Lincoln Community School may finally be turning a corner too. I just left the Lincoln tank, and ammonia is still at 4 ppm. The good news is that the nitrite reading is definitely not 0. It is between 0.0 and 0.25, which is progress. Fish look very healthy and are eating well, and there's been some cannibalism. Checked the filter and added a 3rd bag of Chemi-Pure. Hoping nitrites continue to improve over the weekend. About cannibalism, which is natural, I wrote the following. Sometimes it's desirable to place overly aggressive trout in the "time-out" room, that is, a net breeder put back into the tank for that purpose. 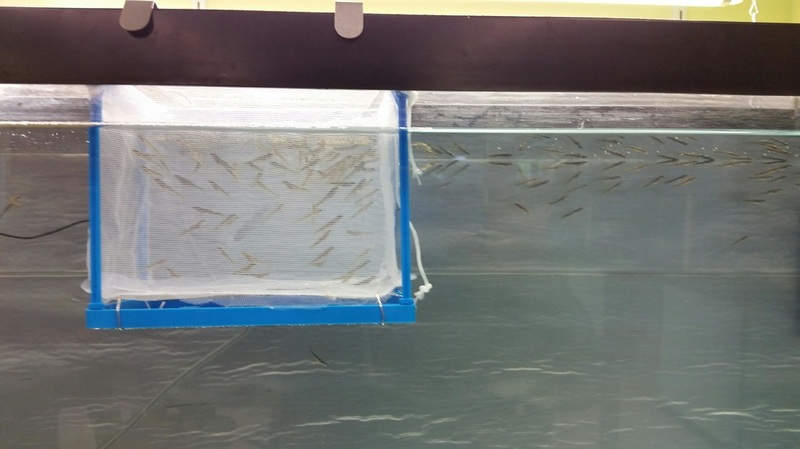 Alternatively, some teachers have had good results by scooping up the smallest fish and returning them to a breeder basket for a while, where they can feed with less competition. Of course, Charles Darwin would never approve. Both Ludlow and Lincoln have high pH. They didn't realize this until they performed the high-range pH test. Ludlow's is 8.4; Lincoln's is 8.2. I'm beginning to wonder whether this may have something to do with the delayed start of the nitrogen cycle. Does anybody have any thoughts about this? At 7:00 a.m. in Castleton on April 5th, it was 9 degrees Fahrenheit! OMG! And I'm writing about Release Day? You gotta be kidding! 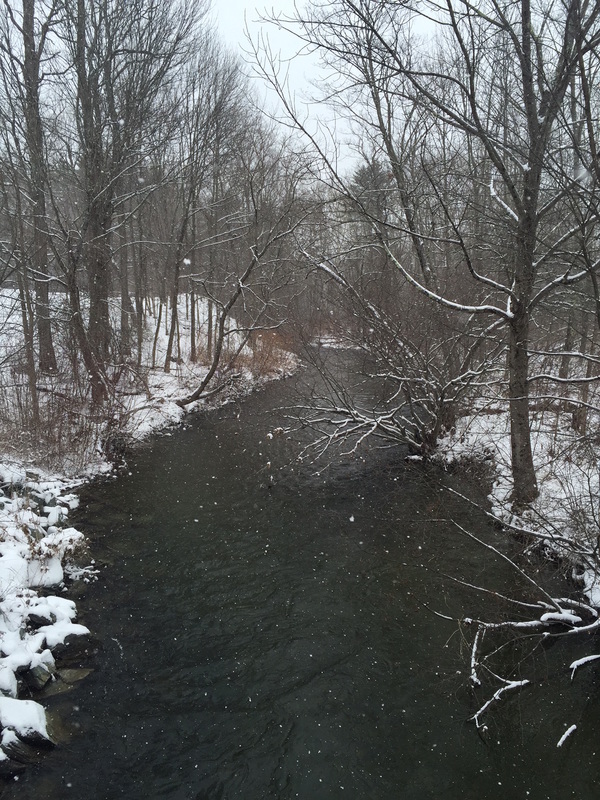 Here's what the Castleton River near my home looked like Monday afternoon. The air temperature was 23, the water 32. Brrr! Those white dots are snowflakes. (We'll get back to matters of temperature towards the end of this blog.) But for now . . .
Release days can be big or small, simple or complicated. Most release days span about two-and-a-half to three hours, but some take less than half an hour. Last year Castleton Village School's Guy Merolle connected his RD to an annual all-school event that involves students and teachers traveling to a local state park to learn about and pull invasive plants. On the way to the park, the school bus stopped at the release stream; everyone de-boarded; Guy spoke about the history of the CVS project and what they had learned; designated students released the seven remaining trout; people took pictures; everybody cheered; and students got back on the bus and headed for their service-learning project. ​Here's a picture of Guy and his students. This Web site has several YouTube videos of RDs at different schools, some in Vermont, some elsewhere. (The last one is a bit quirky, but it may give you ideas,) If you search on YouTube, you'll find even more. Our Maryland TIC manual has a separate section on RDs with lots of great information/suggestions. In the latest manual edition, it's Chapter 9. ​Here's a link to the RD videos on this site. ﻿Simple, brief releases are self-evident, and I'm sure you don't need my suggestions for those. Just be sure you've followed the guidelines in my last blog for the where of RDs, especially those related to safety. If you have the time and want to plan a longer and more multi-faceted RD and if you can get the volunteer help, here are a few ideas. 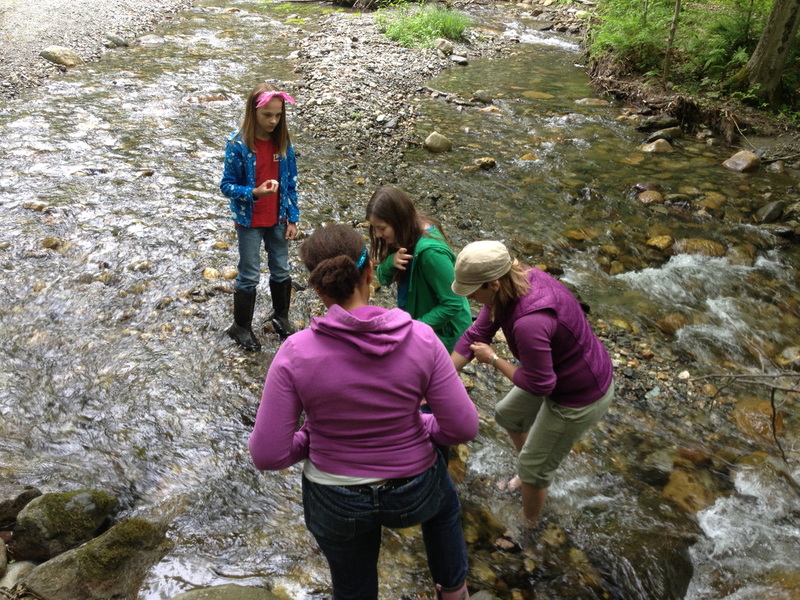 Teach students how to analyze the release stream, finding its runs, pools, pockets, and riffles as well as its woody debris, underwater structure/protection, and the trees and shrubs that provide protection from predators and excessive sunlight. Study and evaluate the quality of the "riparian zone" (if you don't know what that is, look it up; it's very important). Estimate the volume of the stream. Measure the speed of the stream. Test stream water, including for phosphates. After doing 5 through 7 above, you could, if you wanted, have students of a certain academic age calculate the "phosphate load" being delivered from that point on the stream to the watershed below. And perhaps the piece de resistance: "electro-fishing." This, usually conducted by a Fish and Wildlife staff person, involves putting an electrified probe into the water to temporarily stun fish so that you can examine and measure them, etc. It's always a hugely popular demonstration. ﻿In addition, if you're very fortunate in terms of the resources/opportunities of the release site and if you've found the right volunteers, here are some further possibilities. have a picnic on the resort grounds. Clearly, this kind of opportunity won't be available to the vast majority of schools, but this list may give you an idea of what could be possible under the right circumstances. Finally, you'll want to release your fish. Releasing your fish as the last activity of the day allows tension and excitement to build. If you have only a very few fish, you could have one student, on behalf of the whole class, release them all. That student could be chosen by lottery, elected by the class, or the student who, on a basis of a point system you designed, won the honor. 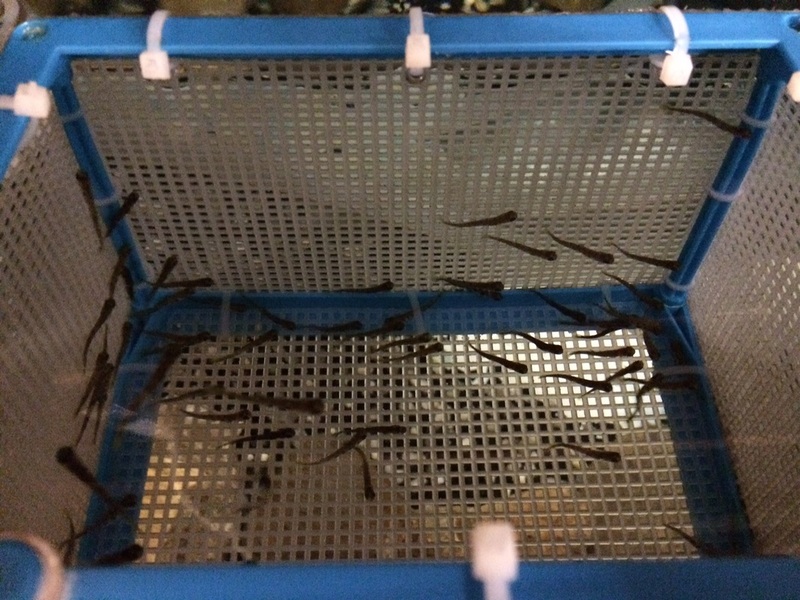 Many classes have enough trout to allow each student to release at least one fish. Sometimes, the RD plan is group-based, and, in that case, each group may be allocated a percentage of the total number and allowed to decide how their group wants to do the release. However you choose to approach it, it's desirable to get everyone together at the end and ask for reflections/reports, and perhaps to celebrate with a cake or cupcakes. the local "natural resources conservation district"
other sportsmen's groups, e.g., New Haven River Anglers, etc. Fish are adaptable to a degree, but unlike humans who apparently can survive the mid-winter Polar Plunge Challenge as well as a dash from a snowbank into a roasting sauna, if at all possible, trout shouldn't be subjected to thermal shock. You'll recall that in late-December and early-January I frequently updated you on the temperature of the water at the Roxbury Fish Culture Station so that you could adjust your tank's temperature to be as similar as possible to the hatchery's. Now, as your Release Day approaches, you need to take responsibility for determining the temperature of either your release stream or at least a proxy for it, that is, another area stream the temperature of which is likely to be close to that of your designated release site. You can either do this yourself or recruit a volunteer, parent, or partner to do it for you. I'd suggest that you check the temperature a week before your release and then again two or three days before. I keep a thermometer on a 20-foot string in my car so that, if I cross a bridge over a trout stream and have an extra three minutes, I throw my thermometer into it, keep it in the water for a minute, and check the temperature. Release Days are exciting events for students, teachers, parents, and community partners, but members of the press love them too! I've found that reporters and, if they have them, their colleague photographers are often eager to leave their offices in spring to join a group of enthusiastic kids as they slosh around in a stream, finding magical things. The more positive publicity we can get for TIC, the more other schools and their parents will want to adopt the program. It may also open the door to new funding sources. If the press covers your release event, please be sure to thank those who provided financial and human support, including, if you'd be so kind, my organization, Trout Unlimited. As my former secretary used to say (and probably still does), "Have a nice day!" Photos and videos: See what other Vermont TIC trout look like and what your colleagues are up to!﻿ And ammonia!! Here are a couple of short videos that show you what some of the trout are looking like. Mt. Abe's Samantha Kayhart shot the first one, the better of the two. I shot the second in Guy Merolle's Castleton Village School classroom. In both cases, the fish look terrific. Here's some of the beautiful artwork produced by Lisa Marks's 3rd graders at Ludlow Elementary School. Lisa has sent the complete set of student drawings to a publisher, who will turn it into a hard-cover book, copies of which will be given to two volunteers, the school library, and Okemo Community Challenge, whose financial support made the program possible. I saw these wonderful pieces while visiting Ludlow's students last Friday. Lisa had invited me because her students had more than 28 questions they wanted to ask me! For almost an hour, I did my best to field the students' often very thoughtful questions. Then we teleconferenced with "The Big Guy." Chuck Dinkel, Maryland TIC coordinator, who had agreed to allow me to call him--in California while he was visiting his 99-year-old mother!--so that the LES students could ask him the questions I couldn't answer. For the next 35 minutes, Chuck was wonderfully informative, encouraging, and humorous. ​Here's a photo of the LES students, community volunteer Kathy Ehlers (in stripes), and me (in the orange TU hat). But on that visit, there was also some important work to do. Lisa's tank had for over a week been running ammonia levels of 4 ppm. None of us have been able to understand why that's gone on for so long and, especially, why her nitrite readings were still at zero. One of the concerns was that this may be due to the large amount of light-brown debris that was accumulating on intake surfaces and especially apparent when anyone siphoned the gravel. At first we thought it was algae. To the upper right you can see what it looks like. Gross, huh? The light brown stuff is bacteria/fungus growing from the uneaten feed, most likely it's getting caught in that filter and using it as growing media. Given the higher protein levels in starter feed, it's fairly common; just do the best you can to remove it. It wouldn't even hurt to pull the filter off and wash it in the sink (short shut-downs for that if necessary won't hurt). Just do it first thing in the morning before first feeding. That could also be contributing to the higher ammonia levels as well. If the fish are eating well and growing, there is less concern with the ammonia levels. The time to start worrying is when they stop feeding. I think she's on the right track by reducing feed levels. The Maryland fisheries biologist said something similar, so we relaxed because it seemed that we had the scientists at our back. On the left you can see the recent test indicating ammonia of 4 ppm, but on the right is a photo, taken 4/3/16, of Lisa's healthy-looking fish. The video below confirms that as well. Lisa's pH had been registering 7.6, the top of the regular pH test scale, so I suggested that she do the high-range pH test. She did that, and it turned out to be 8.4! Why are their fish not dead? This is a baffling question. We know ammonia is supposed to be bad for trout. 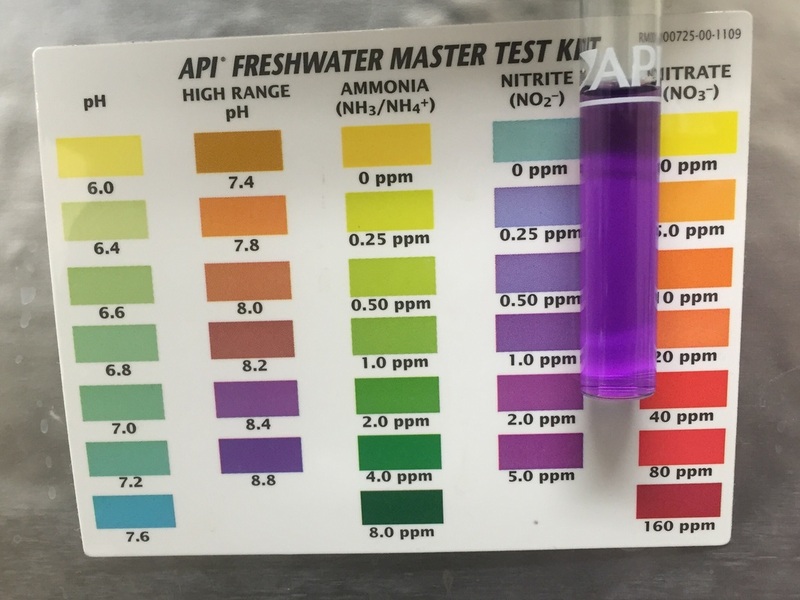 And the latest science we've received (see "Article about relationship among ammonia, pH, and temperature" in the Water Chemistry & Trout Health collection), tells us that Lisa's tank conditions should be near-lethal for the fish. Why is nitrite not rising? The answer may have to do with their filter configuration. Guidelines for filter set-up have changed. We used to use two containers of Chemi-Pure, now we recommend four. But the equipment list in circulation in the fall still called for only two containers, so Lisa and Kathy improvised. They used a zip-tie to divide each bag in two and hung it, like a saddlebag, over the plastic divider between the two of the compartments of each basket. (I did something similar at several schools I assisted except that rather than keeping the two half-bags connected, I used two zip-ties, cut the bags apart, and set them down of the floor of the compartment.) It may be that, suspended over the plastic dividers as they have been, Lisa's Chemi-Pure has not had enough water flow to allow nitrifying bacteria to develop adequately. Over the weekend, Lisa bought more Chemi-Pure, and on yesterday, she and Kathy added it to their filter. Let's see if that helps! If this works and nitrite starts to rise (it will probably take a while for the bacteria to get established in the Chemi-Pure), you'll hear a deafening, happy cheer from one Ludlow Elementary School classroom! ​This is exciting work, isn't it? Release Day #1: when and where? This Friday, it will be April. Eight days after that, Vermont's trout season opens. And the weather's getting nicer every week. So it's time to start planning your Release Days. Most schools schedule their Release Days for the last two weeks of May or the first week of June. A few go earlier, but those three weeks tend to be a time when you can count on the weather: it won't always be sunny, but it probably won't be too cold. Depending on what you plan to do at your Release Day--more on this in my next post--you might also want to schedule a back-up rain date. It's not that you and your students can't have a very successful Release Day in the rain, but a downpour could "dampen" most people's spirits, and raging torrents because of days of heavy rain would pose serious risks. Most schools transport students to Release Day using school busses. If that's going to be the case for you, you may need to get your reservation in ASAP and perhaps even schedule your release around the availability of transportation. A final consideration is the availability of volunteers. 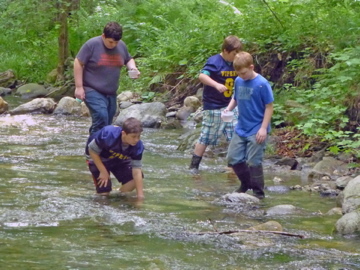 Most schools plan Release Days that include a variety of in-stream or stream-side fieldwork activities. In almost every case, it's helpful if not necessary to enlist the help of parents, co-workers, Trout Unlimited members, or other community volunteers. You wouldn't want to schedule your Release Day at a time when the volunteers you need can't attend. Remember that Tom Jones of the Vermont Fish and Wildlife Department needs to approve your release site. Normally that is done in the fall as part of the process of requesting eggs. If for some reason you did not request his approval, you can contact him at tom.jones@vermont.gov. Depending on where your school is located, you may have several fabulous release site options close by or you may have no good options without traveling a distance. What's the perfect release site? 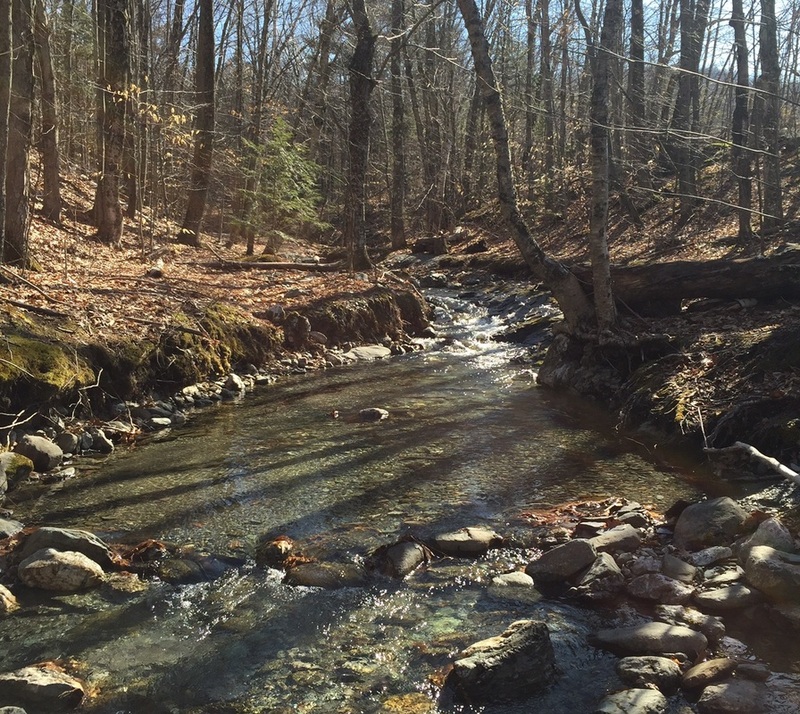 I often describe it as "skinny water," a small tributary brook that's just big enough to support trout and the bugs that will sustain them but small enough so that nobody, not even your most over-eager young student, can get into trouble. ideally with an "assembly space"--such as a cleared stream bank, meadow, or lawn--where you can meet before and after activities for such purposes as giving instructions, breaking into groups, reporting on what you've found or learned, etc. on public land or on private land that you've been given permission to use. ​Below I've inserted a few pictures of streams that I consider terrific release sites. I took all these photos this past Saturday, March 26th. Your local streams may look different. Here are a few more examples, these of somewhat larger streams, with students (and others) in them. Finally, if you're having trouble finding a good release location, ask for help, either from (a) stream-fishing-inclined parents or community members you know, (b) your area Trout Unlimited TIC liaison, or (c) me. ​The next blog post will address the who and the what of Release Days. Stay tuned! The Big Guy weighs in! Within hours of publishing my last blog post Sunday night, and sharing it with Chuck Dinkel, TIC Coordinator for Maryland and D.C., whom I've often referred to as the country's TIC GURU, I got a wonderfully detailed and informative response from Chuck. I think you'll find it helpful. Make sure teachers add 1 teaspoon per 55 gallon tank for a 17.9 ppm increase and not 1 tablespoon. I’ve had a couple of teachers who misread the Tsp and Tbs notations and added too much. Also, the carbon from the baking soda is the food source for the autotrophic bacteria. NiteOut II bacteria are autotrophic and use KH as a source of carbon during the nitrification (oxidation of ammonia to nitrite and then nitrates) process. When KH drops, the pH also tends to drop, and around a pH value of 6.0, the bacteria stop reproducing. We know that as pH increases towards 7.8, the ammonia component of the ammonia test increases while the ammonium component decreases. I used to think that having an ammonia test reading of 3 or 4 at a pH of around 7.2-7.4 was okay, since most of the reading was ammonium. The fish could tolerate this. However, I have since determined, from a review of the chemical equations taking place, that both the ammonia and ammonium participate in the nitrification process and both have to be converted to nitrites and nitrates by the NiteOut II bacteria. So the bottom line is it is really a good idea to keep the ammonia reading low so as to reduce the work required by the bacteria to oxidize the ammonia plus ammonium. Cloudy water is often caused by excess nutrients in the water. Make sure teachers are proactive about siphoning the tank bottom and gravel to remove excess food and fish waste. Also I have rarely seen a build-up of food on the mesh intake of the filter. I do think this is an indication that too much food is being fed. We recommend teachers divide the amount of food for a given day in half and feed in the morning and afternoon. Special Blend contains bacteria that reduce cloudy water by promoting flocculation (defined below) and settling of organic and inorganic particles. Perhaps adding an additional dose of Special Blend will help the cloudy water problem. In most cases the cloudy water I've experienced in some tanks seems to be more a cosmetic than fish-health issue. Thanks, Chuck! You're the best. Last week Bob Wible reported that the Lincoln Community School discovered their KH (carbonate hardness) had plummeted to 35 and that their ammonia was 4 ppm. PH was 7.6, and nitrite and nitrate were 0. When Bob retested KH after adding baking soda, he found it was 214 so assumed that the earlier test might have been an error. But this is a good reminder that teachers (not young students) should be checking KH at least once a week. KH can decline over the course of the TIC project; when it does, pH can become unstable, which stresses the trout. For more information, read the article titled "Baking soda, alkalinity, and carbonate hardness KH," which can be found in the Water chemistry and trout health folder (link below). Lincoln's ammonia reading of 4 ppm could be dangerous, but they're not the only school to report elevated ammonia levels. The ammonia in Lisa Marks's Ludlow Elementary School tank has been reading 3 ppm for a while. The API freshwater test kit that we use measures two types of ammonia (in the same test), ammonia and ammonium. The former is very bad for trout, but the latter isn't harmful at all. There's almost no way to tell which type is elevated. (To learn more, read the "Article about relationship among ammonia, pH, and temperature," in the Water chemistry and trout health folder [link above].) I said there's almost no way to tell which ammonia you have. While this is not foolproof, the appearance of the fish themselves may help you decide. If the fish are active and if you think they look "happy," you're probably registering ammonium, not ammonia. If they seem lethargic, sick, appear to have taken on a dark coloration, or especially if there gills are redder than they have been, any of these might be signs of high ammonia levels. Do any of you dream about your fish or, even, have nightmares? I hate to admit it, but I occasionally do. This past Wednesday night, for example, I dreamt about the fish in Ed Robbins's tank at MRUHS. In my dream, he had many hundreds of big, beautiful fish. They were traveling tightly packed together in massive schools that swarmed at high speed around the tank. What surprised me, though, was that they were in their spawning colors, the way mature brook trout look in October. Even in my dream I knew that it was early spring, not fall. Hmmm? And then Thursday night, I had a less pleasant dream about Lisa Marks's fish at Ludlow Elementary. Her fish didn't look well. In fact, one enormous brookie--it had to be at least three pounds!--was prostrate on the gravel, close to death. I could see, however, that its left eye was still bright. Later I was thrilled to realize that I was only dreaming and that, as far as I know, Lisa's fish are doing well. Whew! What do we hear from our schools? The fish seem great. We have lost about a dozen, with a couple that look like they are "pinheads." I'll be reassessing after the weekend. We have two that are still alive, but are not developing appropriately. 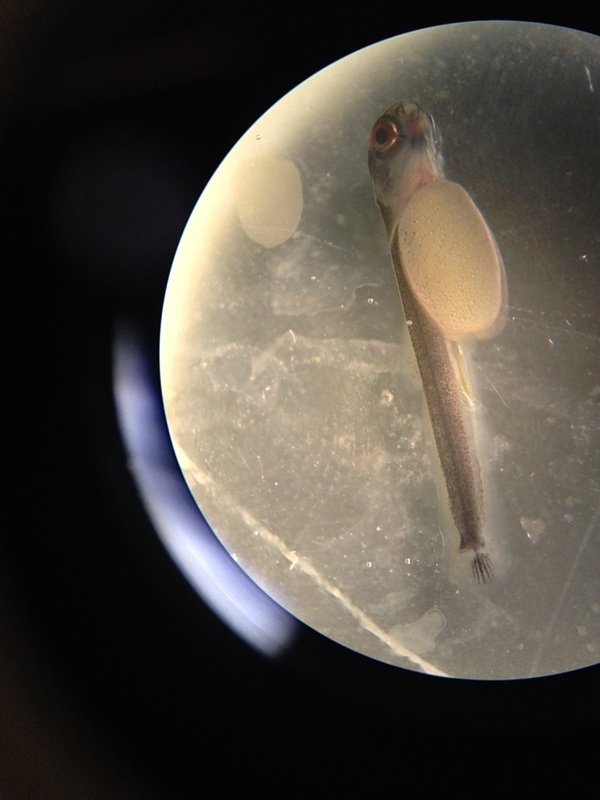 We have been using those two fish as our "subjects" to examine under the microscope. The students love the fish! The picture to the right is of Angela's fish. All is well here. We have lots of healthy looking trout. 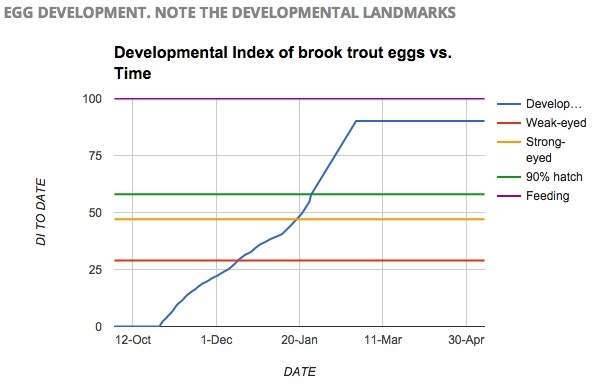 We have also reached "the cliff," and weaker trout are dying off at a high rate (see population curve: https://sites.google.com/a/arsu.org/mr-merolle-s-website/our-brook-trout-1). I have started putting sickly looking trout into "sick bay," where they may have a better chance of getting food, and where they will be easier to find and remove if they perish. We still have not detected any ammonia or nitrite, but the nitrate is soaring. Our hypothesis is that our aquarium started with a high level of healthy bacteria, perhaps they were dormant over the summer. Ammonia and nitrites get consumed as quickly as they are produced. Karli Love at Dorset School gave this update. Dorset School is holding strong with about 40 fish. LARGE and HUNGRY. Frequent water changes, adding nitrifying bacteria and lots of siphoning seem to be keeping our trout happy! PHS fish are doing well. We have been doing our water changes and feeding our free-swimming trout. They seem to get bigger every day! Keith Harrington, Poultney Elementary, contributed this report. 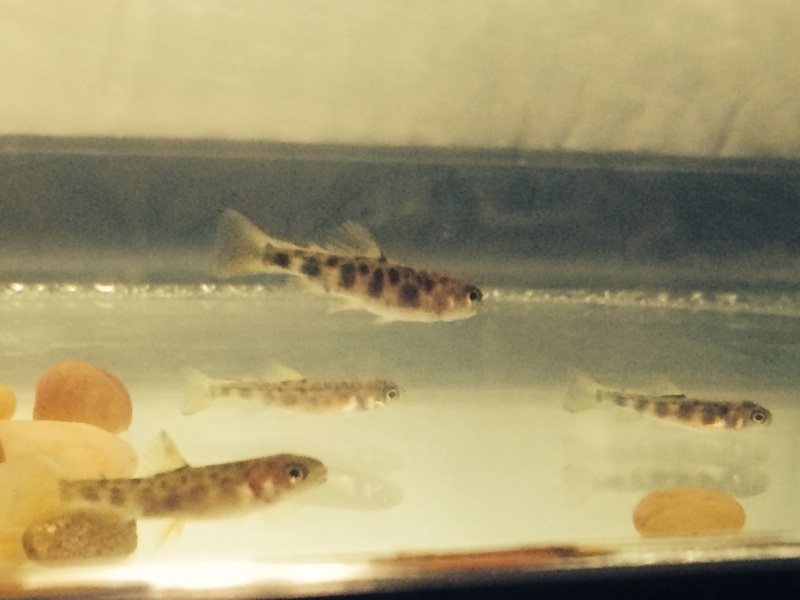 Our trout at Poultney Elementary School are doing very well. Since we let them out of the breeder basket we have found just a few fish that did not survive. All of them were significantly less developed then the others, which tells me they either were not ready to be out of the breeder basket, or just never learned to eat. Those cases have been few and far between though. 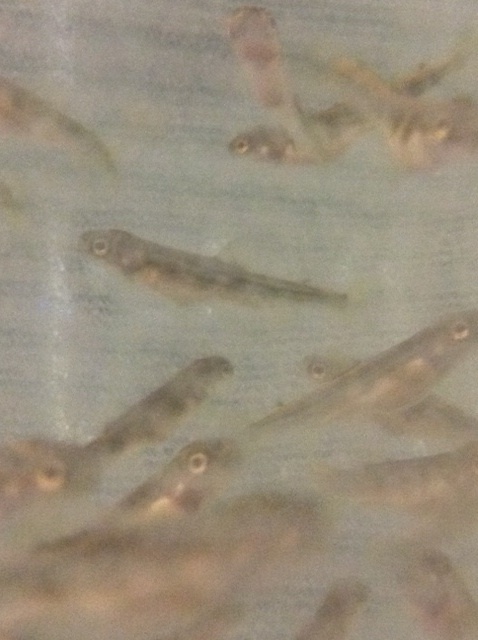 We have well over 100 happy healthy trout that are growing and developing like crazy. We did have ammonia spike to quite a high level at one point, but after some serious vacuuming and water changes it stabilized. Our pH regularly runs about 7.6, and all other levels stay pretty steady. The mesh over the entrance to the filter works well, but we have noticed that uneaten food tends to gather on it and we need to change it or take it off and clean it every week or so. It could be that I am just feeding them more than I need to. Overall we are very pleased with how it is going. We hope everyone else is having great success. I have one tank that is dealing with cloudy water. I'm thinking over feeding!! Am trying to get water test numbers. Troubleshooting | www.troutintheclassroom.org and search for "cloudy." Be well! And let's hear from you. I'll get to the challenges many schools are facing in a minute, but first I wanted to show you the cool video that Seth Bonnett, of Manchester Elementary and Middle School, shot underwater using a GoPro camera. Nice job, Seth! The second video is of the trout at the Dorset School. If you look carefully, you can see some dead or dying trout in one of the corners of the breeder basket. The third video, from Jason Gragen, is of the trout at NewBrook School. That's followed by a photo of Jason's students feeding their fish. Now that the fish in most Vermont TIC tanks are feeding (and urinating and pooping), water chemistry levels have become a serious concern. Here are a couple of recent reports from teachers. We left for the weekend with water numbers looking good for ph, ammonia, nitrite, and nitrate. I ran the tests this morning (3/14/16), and we are at elevated levels of nitrite at 1 ppm, and ammonia at 0.50 ppm. This is the first test this year that we've run purple for the nitrite. Out of curiosity I started investigating. I had found one fish stuck against the backside of the filter intake's mesh, and decomposing. It wasn't visible looking down through the top of the tank because our filter is snug against the glass. So, I'm guessing that it must have been there for a few days or more. I don't believe that we've been overfeeding at a couple times a day. I've been following the TIC binder suggestions for water maintenance. I performed a water change, and gave the rocks at the bottom of the tank a good vacuum. I pulled up a lot of waste from the bottom, as I have on previous times as well. We had a casualty. There are 15 other fish that look skinny and I have noticed they haven't been feeding which was the same for the one we lost. Is this normal to have a few fish that just never really ate. They seem to be mostly in one breeder basket. Since one of our breeder baskets doesn't have as many fish as the other three can I combine the fish into another breeder basket that doesn't have as many? I wasn't sure if they would be territorial as far as the mix of the fish into new baskets. I'm still hesitant to drop them into the tank. It just seems so big! We have about 15 fry that are laying at the bottom of the basket and they are definitely not feeding. There are three in that basket which we move from the other baskets that are now swimming up since they aren't competing with the larger fish. Those on the bottom are very skinny, have a silver color to them and only wiggle if you move them gently with the pipette I use to clean the baskets. Could they contaminate the tank and should we dispose of them? My Eden tank is down to 30 fish. Still not feeding. They had a situation where the janitor added tap water without treating it. Also, I believe they missed "swim-up." Maybe they will start feeding soon. The ammonia levels in the tank have been around 2ppm for a week. We did a 7 gallon water change and sucked the gravel on Monday. We will perform another water change tomorrow. It seems the alevin are "groggy" in the morning by hanging around in the gravel. By mid day they swim up to the top but not all. Question one: Is this normal or this an affect from the high ammonia levels? It seems as if the tank is not cycling because the nitrite and nitrate levels still remain at 0 ppm. We've been adding 15 mL of Nite-out once a week (after week 5) along with 10 mL of Special Blend. We have 130 mL of special blend but are running low on Nite Out. My second question: Should we be adding 15 mL of Nite Out twice a week per water change for the remaining time we are raising the trout? It's very common for some alevin not to learn how to eat. I'm not sure why that is, but it seems to happen in all tanks to some degree. The case of the Eden School, where perhaps none of the alevin will feed, is extreme. But teachers and their students shouldn't feel bad if they lose some of their fish at this stage. You will have to remove them because, if they die and decay, their decomposition will cause water chemistry problems. ​Your ammonia and nitrite levels have to rise. Normally ammonia increases; then nitrite goes up (which usually lowers your ammonia); then nitrate goes up (and nitrite goes down). Hi all, At the recent (Maryland) TIC Workshop, Douglas Dent, of Ecological Labs Inc., manufacturer of Special Blend and NiteOut II bacterial additives, presented a Power Point discussing the topic of maintaining our tanks. A significant recommendation from that presentation is that we double the amount of the two bacterial solutions to help compensate for the slower reproduction rates of the bacteria at the 52-54 degree temperatures at which we keep the tanks. One of the most important points that I learned from Doug's talk is, in my own words, the following: The bacteria in your tank should provide the first line of defense against changes in your tank that effect water chemistry balance. Water changes are secondary to biological activity. Allowing the bacteria to do their job will reduce your need for water changes. The log of daily water testing and the overall health of the trout will also help you determine how much water to change and when to do so. This is a very important change regarding the approach we previously took to tank maintenance. What it means is that there may be times when, for example, ammonia levels start to increase that the action required will be to add more NiteOut II to the tank rather than increasing the size and frequency of water changes. To release or not to release? 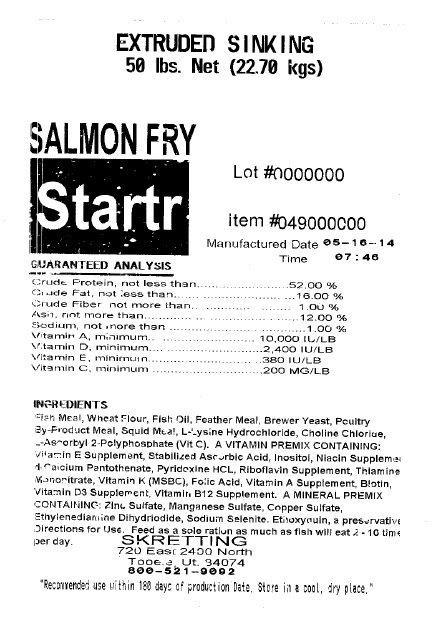 What's in our fish food? LET THEM LOOSE OR KEEP THEM IN THE NET BREEDER? Across the state, some school have all their fish still in their breeder baskets while, intentionally and accidentally, other schools have some or all of their fish loose in the tank. What's the best approach? 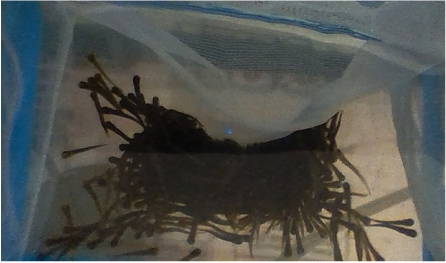 Just checking to see if any teachers have "dropped" their net breeders to the bottom of the tank, and have introduced the brookies to the tank? Yes, some have, Jason. Many of the released fish, especially those that have gotten good at eating, seem to be doing well. If you decide to do it, make sure your filter intake is covered. Our filter has been covered since the get-go, so we're good there. The fish appear to be feeding hardy, and swimming strong (especially the ones in the net breeder that was on the aerator-end of the tank). I think the suggestion to split the eggs up into two, or more net breeders was a great idea. I did notice that brook trout at the aerator-end of the tank fed before the ones at the calmer end of the tank. Maybe because they were using more energy to navigate the "current" created by the air bubbles. Once the swim-up stage approached, I did move the net breeder from the aerator-end down to the calmer end so the feed wouldn't swirl around. I believe that I'm gonna drop the baskets today. WHAT'S IN THE FISH FOOD? I am working with Dawn Adams with the TIC project. I am doing research with my students, and we are wondering what fish food we are using. The bag you gave us is unlabeled. Any information you can provide is greatly appreciated. If you can't read that scan's text, let me translate for you. When can we take the front panel off of the tank? The eggs and alevin should not be exposed to UV light during those stages. The guidance we provide teachers is to keep the top on except when feeding and performing maintenance and it is okay to remove the front cover permanently when you release the alevin to the main tank. I don't get overly concerned about "exposing" the eggs or alevin to light for short periods of time. The kids need to be able to observe them. We have had cases where larger fish have jumped out of the tank when the top cover was left off for extended periods of time. And with the cover on it is less likely that something will accidentally get dropped into the tank. In the wild the eggs are covered by gravel and shielded from light until the alevin emerge and start looking for food. Fantastic Lincoln Community School quilt! 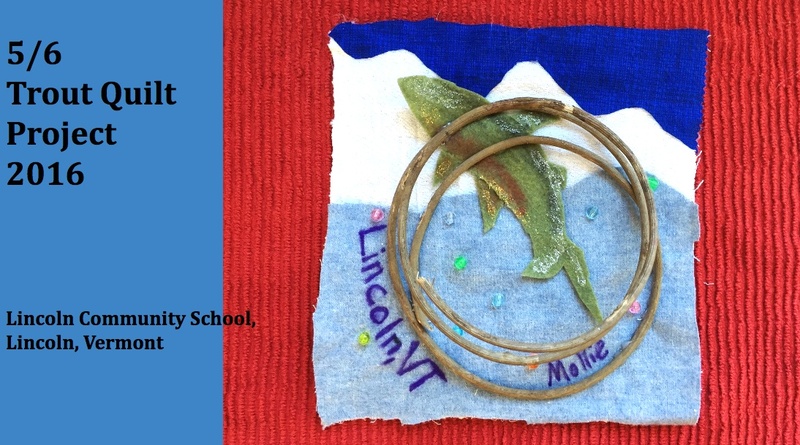 Mollie Sprague, 5th and 6th grade teacher at Lincoln Community School, just sent me the fabulous Google Slides slideshow of the TIC quilt squares that she, her co-teacher Mikaela Frank, and their students created. Here's the opening screen. Below you can see the whole slide show. You may remember the way the TIC quilt project works. Any school that wants to participate signs up. (This year's deadline was February 1.) Then each student (and apparently sometimes the teacher) makes a quilt square. When the squares are finished, the teacher sends one to each of the TIC schools across the country that are participating in the quilt project. Finally, when all the quilt squares have been received, the school turns them into a quilt, which they get to keep. Those of you who attended our November training workshop will recall the beautiful quilts displayed by Jessica West, of Shelburne Community School, and Melissa Rice, of Manchester Elementary and Middle School. ﻿The TIC quilt project not only allows students to express themselves artistically but also provides an excellent opportunity for pulling out a map and learning about the places these other squares are coming from. Inevitably, these squares will represent a broad and diverse portion of our country's physical and cultural geography. In addition, some teachers turn the project into a writing assignment and have each student send his or her square to a specific school with a personal message. In the end, once hung, the quilt becomes an attractive school icon and one that symbolizes the ways in which their school has made continent-wide connections to other similarly dedicated schools, their students and their teachers. Greetings from beautiful Lincoln, Vermont. We are a multi-age 5th/6th grade class. Our little school is nestled in along the western slopes of the Green Mountains. The New Haven River, where we will release our fingerlings in the springtime, runs right by our school and through our town. Many of us chose to create quilt squares featuring the mountains and rivers that surround and define our community. We all share a love of outdoor activities from sports to walking, snowmobiling to skiing, hunting to biking. Hiking in the mountains and swimming and fishing in the river are activities that bring people here together. As one 6th grader wrote, “We all see the sun rising and setting, we share adventures up and down the mountains.” Another student wrote, “I showed parts of life here: an owl home in a tree, a fish splashing in the water.” Many students chose to represent the natural beauty of Lincoln and wrote about the peace we find in the rivers and mountains of western Vermont. 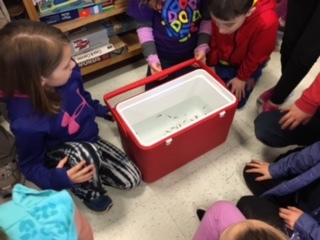 We are having an excellent time raising brook trout in our classroom and feel lucky to be able to eventually release the fish into our home waters. We are looking forward to receiving quilt squares from other schools and we truly hope you enjoy the ones we have made. We had a lot of fun creating these pieces as they express some essential elements of our community and the place we call home. ﻿Nice job, Mollie and Mikaela!! Seeing the photo below of Samantha Kayhart's fish at Mount Abraham Union High School reminded me how important it is to put netting over the filter intake. Look at all those loose fish to the right of Sam's breeder basket! Last year one of our teachers had almost all her fish sucked into the filter. I wanted to let you know that tonight we will be presenting a slide show and little talk to the school board, which also consists of people that provided the grant for us. I have a couple of questions: Do we need to still calculate the DI now that the DI has reached 100 and the fish are all eating? When can we take the front panel off of the tank? You can stop calculating DI. The principal reason to keep the tank covered by the foam is energy conservation. Covering the tank can also reduce the risk of algae growth (depending on the lighting conditions in the room). I advise that you take the top and front off for at least a few hours each day if not all day and then put them back on at the end of the day. That's as long as you don't notice algae growth. It's great that Lisa's third graders will be presenting to the Ludlow school board. What a great opportunity to develop public speaking skills! Lisa has promised to send some pictures of that event. A quick question. We have a noticeable spike in our ammonia levels. Up to like 4.0. Should I be worried? the fish are quite active, and I did read that sometimes with high ammonia levels they can be gasping for air and acting erratic. Do I need a complete water change? Thanks. Thanks for asking, Keith. I'd take my cues from the fish. As long as they look and act good, I'd hold off doing any water changes. There are two compounds that are measured by the ammonia test, ammonia and ammonium. The latter is not harmful. Below you'll find a link to the "Water chemistry and trout health" folder in the TIC resources collection. Once there, read the articles titled "What ammonia, nitrate, and nitrite levels are okay?" and "Article about relationship among ammonia. pH, and temperature." On March 1, Guy Merolle reported something a bit surprising. 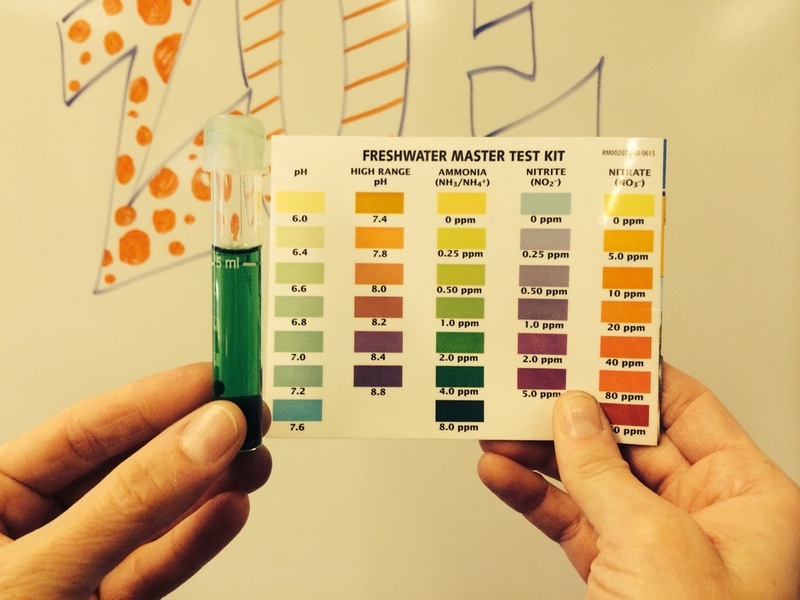 The Castleton Village School TIC tank has elevated nitrate levels. Hmm? Normally that happens late in the tank-cycling (nitrogen cycle) process after ammonia levels have gone up and down and then nitrite levels have gone up and down too. Their fish look good though (picture below). So I'm assuming there's not a serious problem. I got this happy update a couple of days ago from Kaitlin Cioffi-Grote. We had some excitement at Poultney High School on Friday. We had lost several eggs at the beginning of January from the breeder basket because of the larger netting. We swapped nets after for the finer ones that come with the net breeders so we wouldn't lose any more of the eggs. We just thought that the eggs were lost to the filter and gone forever. Turns out that is not true, we had filled our tank with river bottom rocks so that it mimics the rivers that the trout live in naturally. Guess it was a good thing, we had the river rocks because we have started finding our lost trout eggs. 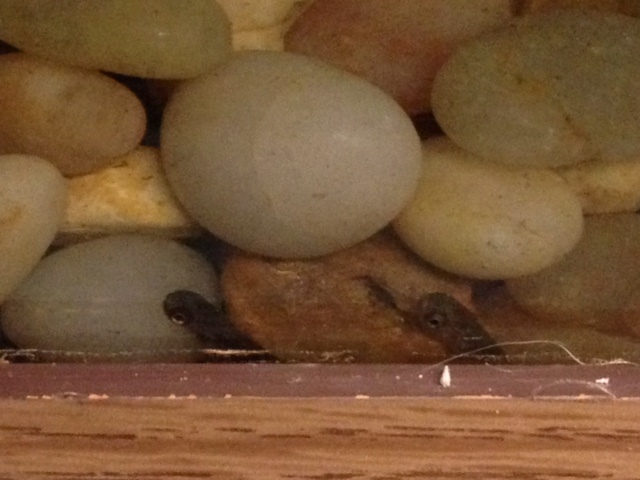 The young trout are doing well hiding in-between the rocks safe from the pull of the filter. We have started feeding so we are working on slowing recovering our lost trout and placing them back into the net breeder so they learn how to feed! ​Here's the picture Kaitlin sent me of their fry poking out of the gravel. ﻿Check out the Trout Video page. There are several great videos there, and I just added a new one that shows how Trout Unlimited volunteers and Fish and Wildlife personnel work to improve brook trout habitat. The focal point of the entry hall at the Braintree Elementary School right now is a colorfully decorated fish tank—home to a batch of tiny trout “fry” that are the special responsibility of the 4/5/6 grade class team-taught by Janni Jacobs and Betsy Shands. 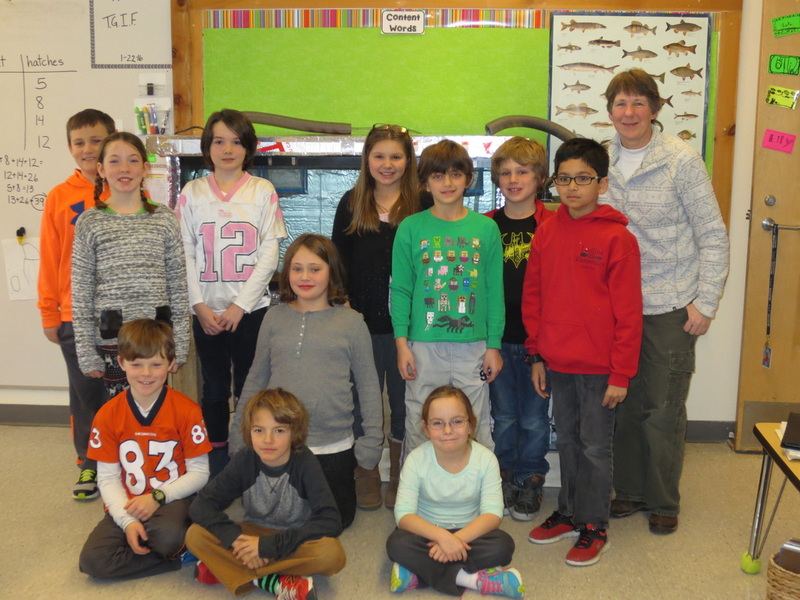 The school is participating in Trout in the Classroom (TIC), an environmental education program found in over 4,000 schools across the country, that is becoming increasingly popular in Vermont, where it is sponsored by Vermont Trout Unlimited. Students learn about early trout development, monitor the tank water chemistry, and maintain the water quality. 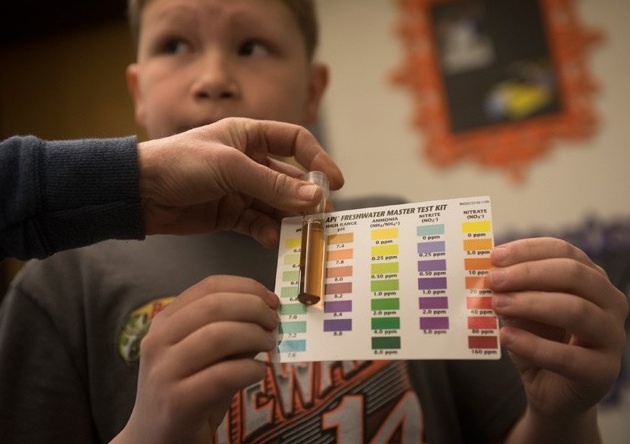 Last Thursday morning, fifth graders Jordan Schultz and Ryan Ryll tested the water quality by filling a turkey baster with water from the tank and used the baster to fill several test tubes. putting five milliliters in each. Jordan explained that she was testing the ammonia level and Ryan said he was testing the pH. “It needs to be between 6.8 and 7.8,” he noted. “The students have been so enthusiastic about this project,” Shands said. “They really enjoy studying anything that has to do with the natural world. Really, they’re doing the same test that the biologist do at the fish hatchery." “There’s a high mortality rate to this type of thing,” Jacobs explained, noting that of the 100 original eggs, there are 98 left, “and if we have 10 left to release, we’ll have done well. The Braintree TIC program is one of three new ones begun in the area this year. Deb Scott’s students at Bethel Elementary and Erik Anderson’s students at Chelsea Elementary are also participating. The students are tracking the growth and development of the trout by calculating the DI (or Developmental Index) each day which is determined by consulting a chart which calculates the growth based on the temperature average. After the alevin begin to feed they will reach their fry stage. At the Chelsea School, teacher Erik Anderson is raising trout with his middle school students. 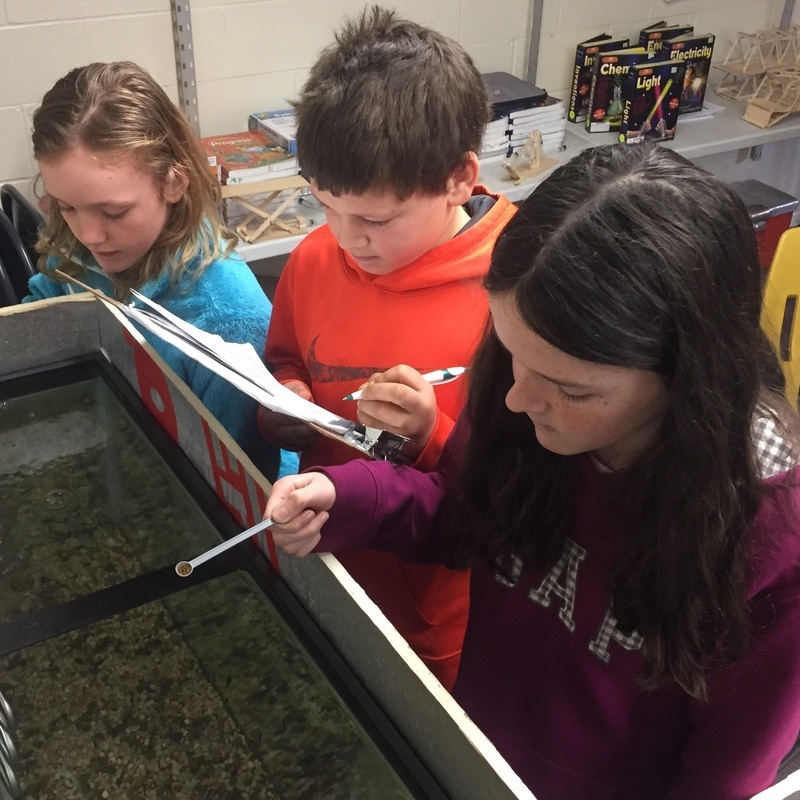 “While all of my science classes have had some exposure to the project, the sixth graders have been the most involved in terms of learning about brook trout and monitoring water chemistry in our tank.,” he explained. “After February vacation, we will begin doing mini lessons for the elementary students in our school. The sixth grade students will show the younger students what they have been learning and doing related to the trout. Over the last three days, numerous reports have come in, mostly from southern schools, all indicating that things are going well in many Vermont TIC classrooms. I checked on them three times this vacation. They are fine and not swimming up. I am looking forward to water testing tomorrow to see how the tank is cycling. Jenn Tifft, at Middletown Springs School, gave this brief report and sent the following picture. They are looking good. A few are starting to make the trek upward. Here is a not so great picture looking down into the tank. Mine are doing outstanding. Many of them are coming up and looking for food. They are growing like weeds. I checked on them during vacation a couple of times, as did Amy. We had no casualties. I guess the next step is how many learn to eat and how many pinheads we have. We are doing well with our fry. We have had only about 15-20 that have not made it so far. We are seeing some swim up, but the majority of them are still just hanging out at the bottom. 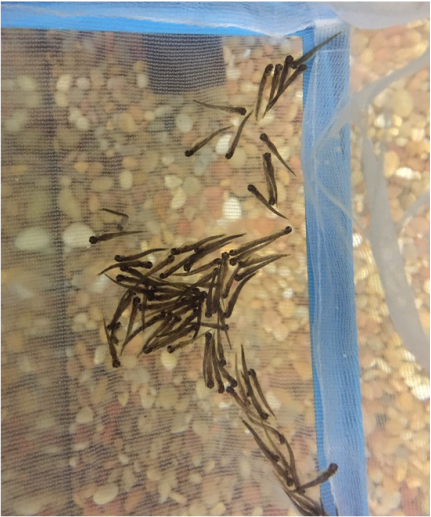 I just wanted to let you know that many of the fry are swimming to the top of the breeder nets, we have started feeding just tiny pinches and watching for 5 minutes at a time or so, they have not seemed to take to the food much, but we will continue to monitor closely. 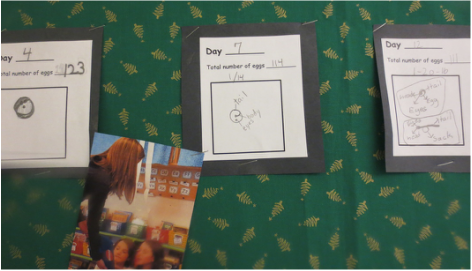 The kids were excited to see how much they developed over the break. They look great. I did offer less than a pinch of food to them this morning (2/22) just to see if they would come up to feed, but not one did so that made feel a little better. The date for swim up is scheduled for 2/2, but I feel like it could happen anytime. For the most part it looks like the sacs have disappeared but there seems to be a small bump where the larger sac was before so my guess is there a little left. A few of them definitely swim up but they don't seem to be able to stay up. Is this normal? Are they technically fry now or are they fry when they feed? It is getting exciting. In one of our baskets the fish are staying at the top until I lift the cover. Then they shoot to the bottom. I have put the smallest amount (pinch of food) in that I can. How do you know if they are actually eating it? In response, I said "You'll see them (a) coming right to the surface and (b) kind of snapping at the food." Looking good! Just got back from break and I don't see any dead at first glance. Some are swimming up, but were not interested in food yet. Mine still have their yolk sacs so far, and we only lost 3 over break which was a huge relief! good, they are getting bigger and swimming more. Hey, Joe. When you get a minute check out my blog post from today (2/22). There is a video (along with a few pictures) of our 2-headed trout. 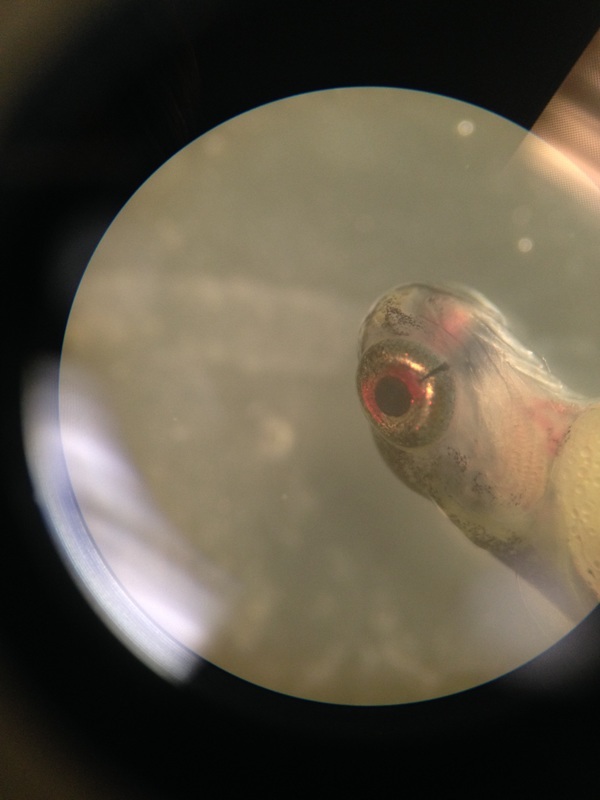 We were able to get about 200 students to see the trout under a microscope on Friday before break (it started as just the 3rd grade but once word got out everybody HAD to see it). In the last day or so nearly all our fish have been swimming up (see picture below). We also noticed a spike in the ammonia level, to about 2ppm. We're planning a water change (more on this below), but should we start feeding too? Our DI is at 82.45. ﻿ Here's how I responded. I'd say that probably you should offer a bit of food to those who swim up. I'm not sure I'd advise a water change at this point. The main reason to do a partial water change is because of high nitrate levels. Raised ammonia levels may well mean that your tank is starting to "cycle." Premature or excessive water changes might only delay this. If indeed your tank has started to cycle, after ammonia levels have gone up, the nitrite level should increase, then the ammonia level should decrease, then nitrate level should increase, then nitrate level increase. I also suggested that Meg read the article titled "What ammonia, nitrate, and nitrite levels are okay?" in the Water chemistry and trout health" folder on the Google Docs site (link below). If your Cumulative DI is close to Meg's, this is a time when it's particularly important to monitor the tank closely, looking for signs that the fry are ready to feed. Look at these great photos taken by students of Ed Robbins at Mill River Union High School! 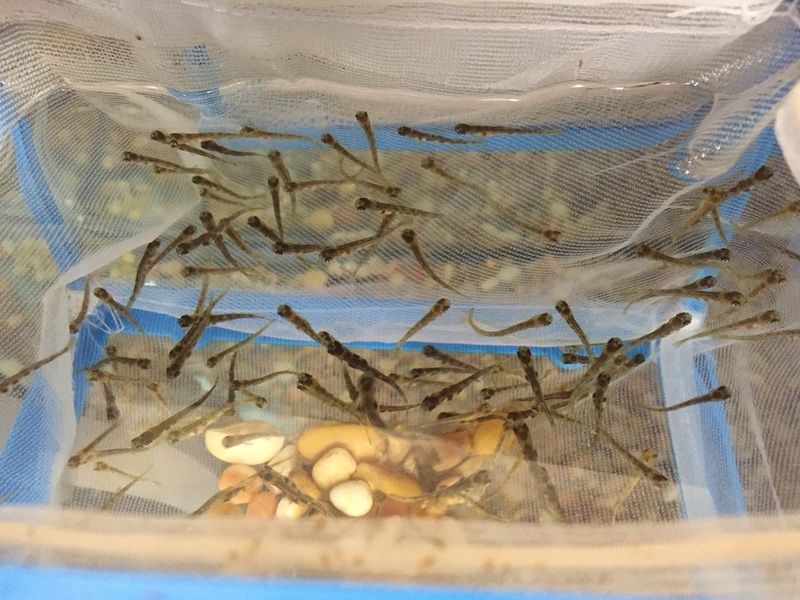 On the question of feeding at the swim up stage, I looked it up (as I haven't reared trout), and the commercial hatcheries start feeding when about half the fry are swimming up. It is a difficult transition, from non-feeding to feeding, and I expect the temptation is to feed too much and get into nitrite/ammonia issues there. If the kids realize that in the wild, these little guys would have a constant supply of microscopic food at this age, they can see how tricky it is to get them to eat when fed by humans. I guess being conservative about amounts, maybe watching to see what they're getting, and very frequent feedings are best. I think each facility and person has a different view on when and how many fry need to be off the bottom to start feeding. It also depends on your species as well, brook trout and rainbows I like to introduce small amounts (like a pinch) every hour or so, once a few dozen are up off the bottom without sinking back down. My take is if they are up they want feed and if you miss it by waiting for half to come up you could loss those early risers. It is a very tricky balance. We will be initiating feed on salmon here in the next few weeks and they start completely different than brook trout. They move around on the bottom and are very slow to rise up and become interested in feed. With that you are trying to get them interested and at the same time not have excess feed on the bottom. See also pages 41 through 43 of the Maryland TIC manual. Third grade teacher Lisa Marks, of Ludlow Elementary School, wrote on Friday with these questions from her students. Has any other school had two headed alevins? At least two other schools have had two-headed alevin. 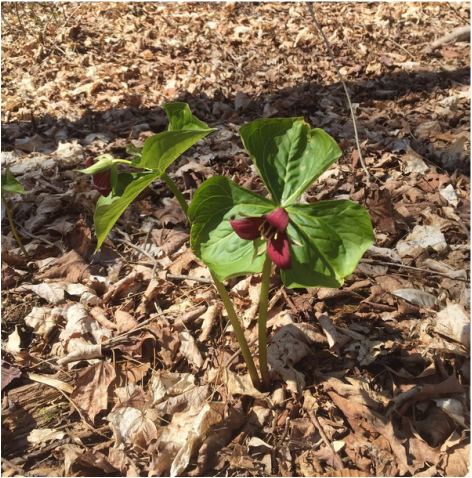 See the most recent blog post <http://vermonttroutintheclassroom.weebly.com/tic-blog> and the entry and photo teacher Jessica West of Shelburne Community School submitted. What does the Microbe-lift Special Blend [and, I’ll add, Nite-Out II] do for the tank? Your filter needs to establish a colony of “good” bacteria to (a) convert ammonia to nitrite, (b) convert nitrite to nitrate, and (c) eliminate nitrate. Both Special Blend and Nite-Out II add different varieties of these good bacteria, sometimes called “nitrifying bacteria,” to your filter. One of Special Blend’s bacteria, called a “waste degrader,” turns excess food and fish waste into ammonia. Then, one of Nite-Out II’s bacteria converts that ammonia to nitrite. 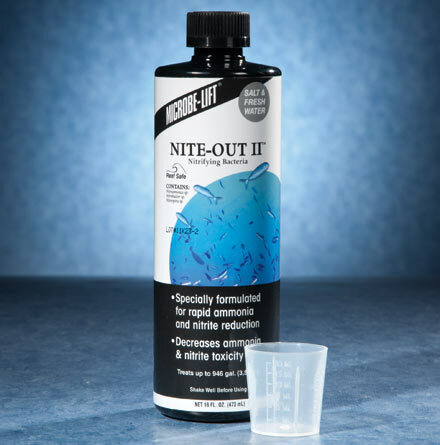 Nite-Out II’s other bacteria convert nitrite to nitrate. Finally, the second type of bacteria in Special Blend convert nitrate to nitrogen gas, which, if all goes well, bubbles out of the tank water and is dispersed through the air. 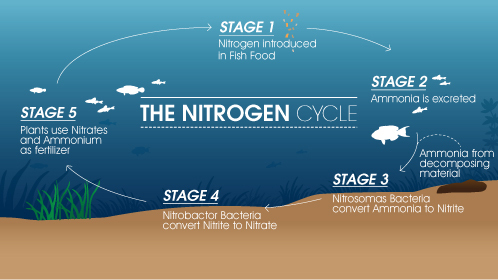 Taken together, these various processes make up the “Nitrogen Cycle,” which is quite important to the health of you tank water and your trout. 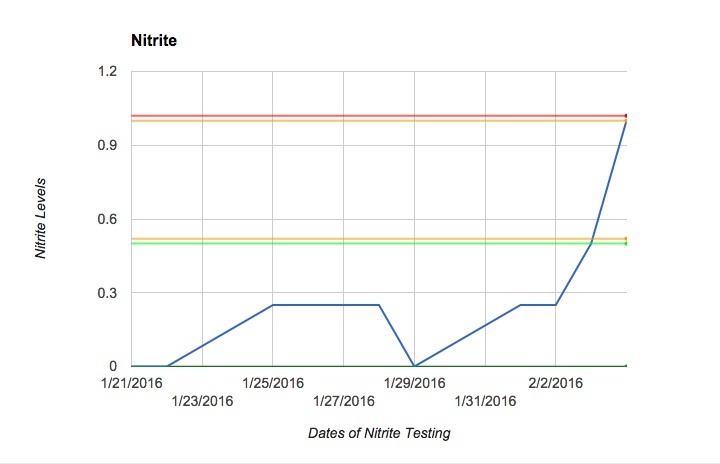 Occasionally, when nitrate levels remain high, it’s necessary to perform partial water changes to lower the level of nitrate. Why does the special blend stink? The smell of “rotten eggs” usually means the solution or water has sulfur in it, specifically the chemical compound hydrogen sulfide. Was there a school that didn’t lose any eggs? What school has the most alevins and how many? I’m not certain since I haven’t gotten reports from all schools, but I’m pretty sure that there are schools around the state that have 180 alevin or more. That high total is misleading, however, because the biggest challenges are still ahead, especially as we approach the “swim-up” phase. Last year, for example, most schools released fewer than 30 fry. I believe the schools that released the most Shelburne Community School, released about 75. How many schools received a second batch of eggs? It was nine if southwest Vermont. I’m less sure how many in other parts of the state got a second batch, but I know it was several. A second batch was necessary when the person picking up the eggs got eggs for several schools. 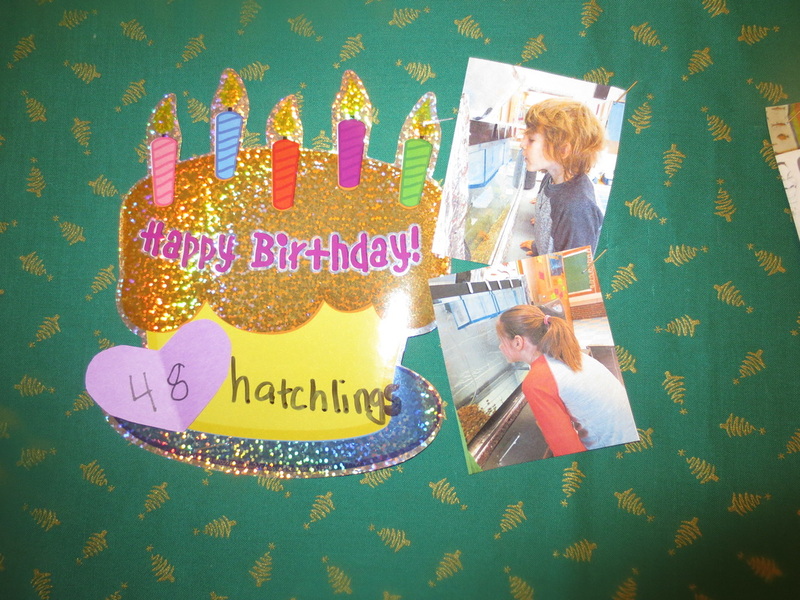 In those cases, hatchery staff treated all the eggs with an iodine solution at the same time. Then they started removing eggs for individual schools. As a result, some eggs sat in the iodine solution for a short period of time while others sat in the solution for far too long. Because of over-exposure to iodine, the shells of these eggs removed later in the process began to partially dissolve, in some cases even before the eggs reached the schools. The staff handled the iodine treatment of the second batch of eggs very differently, and virtually all the second-batch eggs have done extremely well. Can we transfer some of the alevin from a basket that has quite a few alevin in it to one that doesn’t have as many alevin in it? Yes, you may. Just be gentle as you transfer them. They’re delicate creatures, especially at this early point in their development. How many eggs were sent to schools in total? Most schools are using 55-gallon tanks, and these schools got 200 eggs unless they requested fewer. 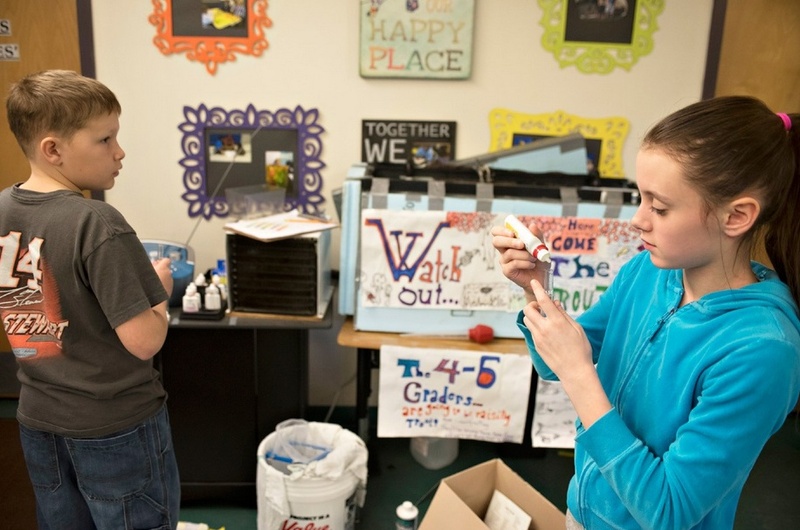 Schools with smaller tanks—typically 20 to 30 gallons—got 100 eggs. Will we be able to meet you? These are great questions, by the way. Keep them coming. ﻿﻿For the third year, Mary Hogan's Steve Flint is using his TIC Web site very effectively. Here's a link to his blog. Check it out. One of the many resources and data collections you'll find there is the chart of nitrite readings I've pasted below. As you can see, they're increasing. Presumably this means that Steve's tank has begun to "cycle," which would be a good thing. Just thought I would send along this photo of one that I pulled out the tank for the kids to examine closely. There's another one too, and they are both still alive! One has been hatched for over a week. The kids are thrilled by this amazing phenomenon. I knew it could happen but did not really expect it to. I have talked to them a lot about the large possibility that they will not survive. Reports coming in continue to be positive. Keith Harrigan, at Poultney Elementary School, said on 2/1: Things are going great here at Poultney Elementary. We have had very low mortality rate thus far. Only maybe three or four a week. We've distributed our alevin spread across three different breeder baskets. 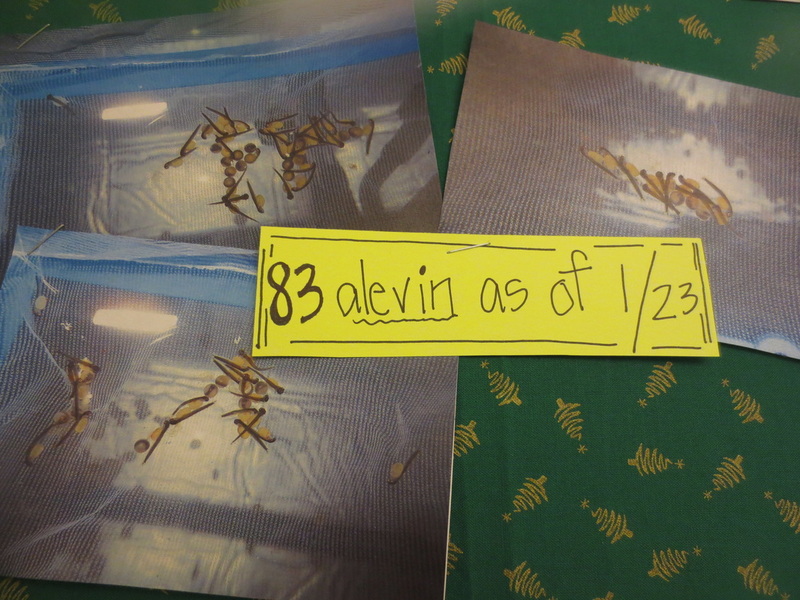 We have had 0 alevin die in the breeder baskets that have just alevin from the second batch of eggs. All the deaths to date have been in the basket that is a mix of alevin from the first and second batches. I am assuming that the ones that aren't making it are from the first batch. 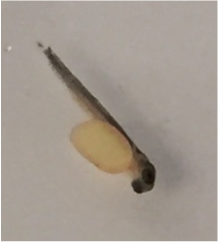 Even though they hatched, they are not going to be able to survive after the high iodine exposure. Lisa Marks of Ludlow Elementary School, offered: We have 111 alevin that are very active. They are staying pretty much at the bottom of the baskets right now. The kids have enjoyed keeping up with the bulletin board. Here are some pictures of the bulletin boards that Lisa's students maintain. Rutland High School's Dawn Adams provided this report. 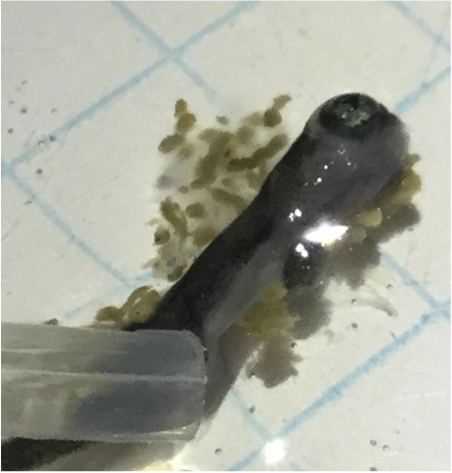 All eggs have hatched into alevin. Our mortality rate was ~25 until the alevin wriggled through the holes of the coarse net breeder baskets. We rescued many alevin that escaped and replaced the coarse netting with the original basket and its finer netting, capturing the escapees via poultry baster. Some alevin remain (anterior-end down) in the gravel at the bottom of the tank. I do not know how many we lost through the chiller and filter. Dawn also provided this picture. Notice how it looks like many of the alevin have consumed most of their yolk sacs. The following day, Dawn added this: I notice the alevin are active in the dark and slow in the light. When I take the top foam off the tank, the alevin are swimming around. However, when the light reaches them, they slow down and hang out quietly in the breeder basket. 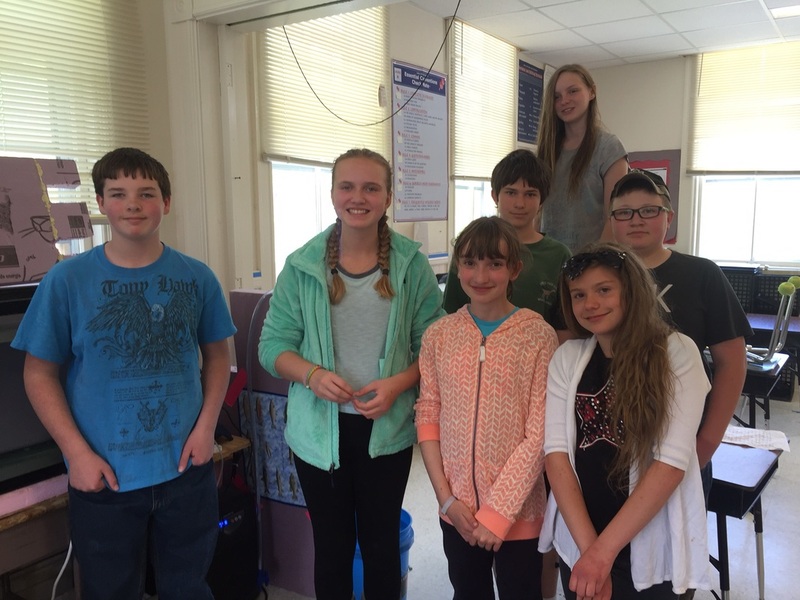 Kaitlin Cioffi-Grote said, The PHS (Poultney High School) AP Biology class has been enjoying watching the eggs hatch and grow. 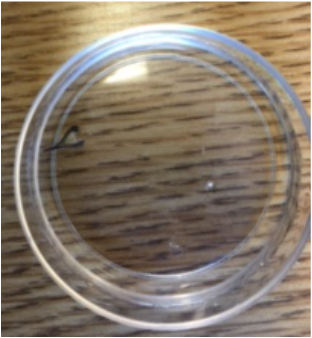 I have attached a picture of one we isolated in a petri dish. I am writing from Essex Middle School. We were lucky enough not to lose many eggs. I believe we are down about 14, with all of our eggs having hatched. We have begun to see the yolk/egg sack beginning to shrink. Last year I assigned students jobs but this made SO much work for me. I have 64 students and all of them have a desire to do different jobs. This year I ran a three-day station seminar where my students got the chance to work about 3-1 with me to learn each job. Then I created a sign-up sheet that allows 12-20 students to do/calculate/record something to do with our tank. What a difference! The seminar is a bit wearing on the teacher, as I repeated the same 30-minute instructional lecture about 21 times to accommodate all students. My students brainstormed, and we will be filming me teach this lecture and they will use their knowledge of tech/video resources to edit it and create something I can play for students in the future. Last year over vacation our breeder box fell. Bob Wible decided that we would split the eggs and let one breeder box go down to the bottom of the tank. We have done so, and those trout seem to be doing well. They have burrowed into the rocks. The kids love getting to see the juxtaposition of trout in the box and in their more natural state in the rocks. We journal our findings every Thursday, and we will be turning those into a class post in the late spring. I am following 11 tanks. All tanks are completely hatched. Since all have elected for swim-up after break, I have had them set temperatures at 46. My thought is that 90% hatch was at least a week early, so I decided to slow down metabolism a little by lowering temp. All is going well and teachers seem to be very happy with program. Also, all have dumped alevin into the tank. ​In June 2012, I retired after 40 years in higher education, having spent the last 32 years of my career as dean at Castleton. 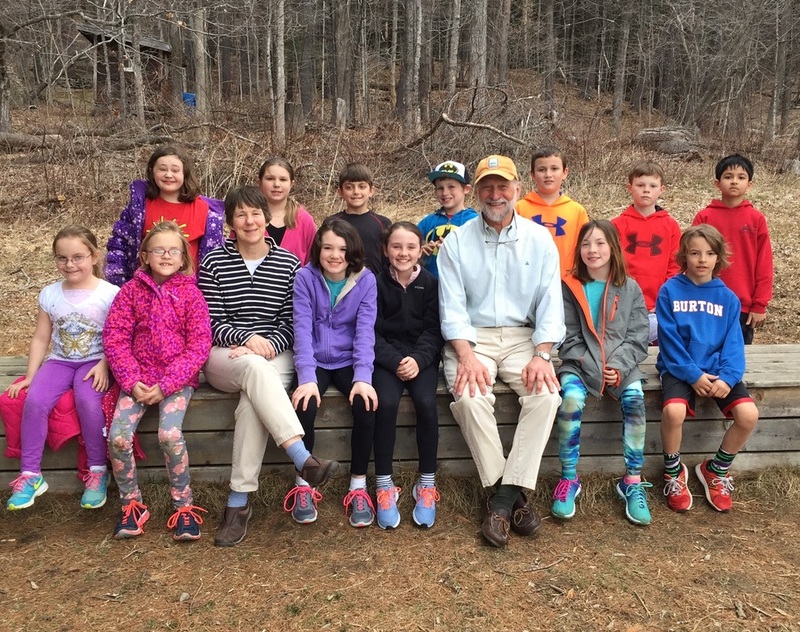 One of the first things I volunteered to do in retirement was to work with Jim Mirenda to help the Dorset School, where his kids and my Vermont grandkids attend, start a TIC program. Gradually that commitment grew into my current role, which is both demanding and highly rewarding.